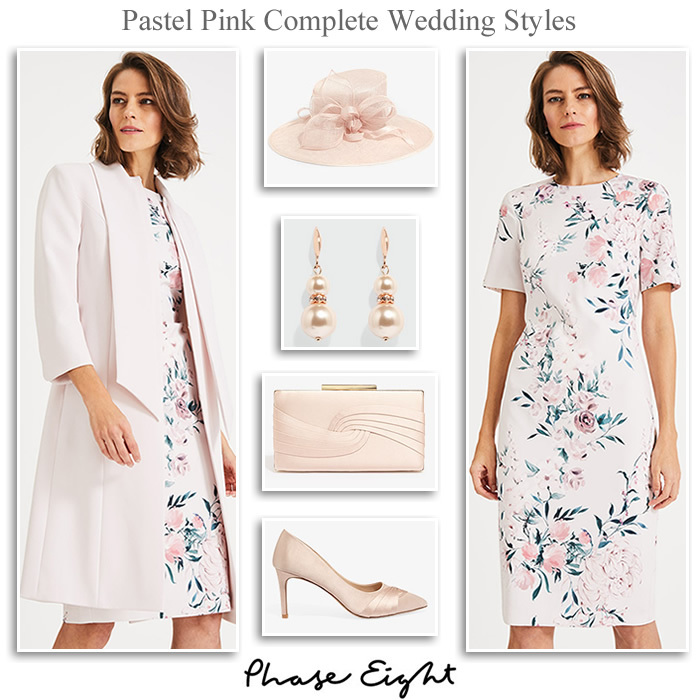 Phase Eight pastel pink wedding outfits for modern Mother of the Bride, Groom and guests. Colleen long occasion coat with tie detail, tea rose floral print short sleeve dress and matching shoes, bag and hat. 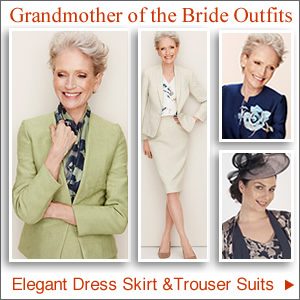 Phase Eight spring summer Mother of the Bride, Mother of the Groom and wedding guest outfits. 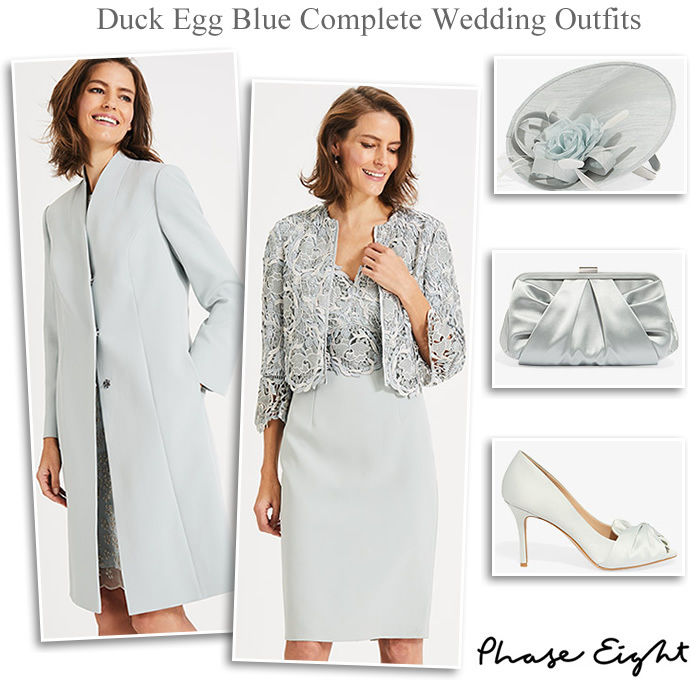 Complete occasion outfits include elegant coats in duck egg blue, lace jackets and matching lace dresses, fascinators, shoes and bags. Phase Eight winter Mother of the Bride wedding outfits in peacock blue teal navy gold and claret red. Jacquard tapework lace and embroidered occasion dresses matching jackets shoes bags and fascinators. 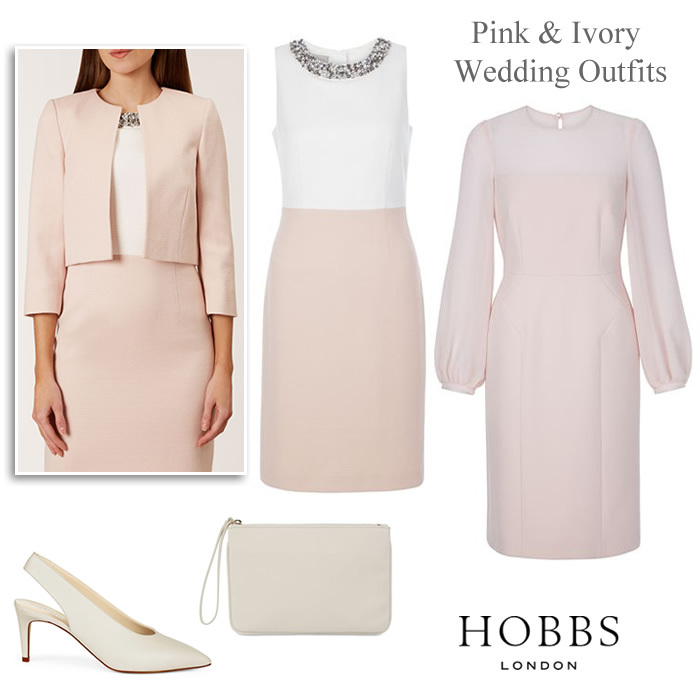 Hobbs spring summer pink ivory Mother of the Bride and wedding guest outfits. SS19 collections include pastel pink long sleeve dress with floaty blouson sheer sleeves, contrast embellished neckline dress and matching jacket. Complete with ice white slingback courts and clutch. 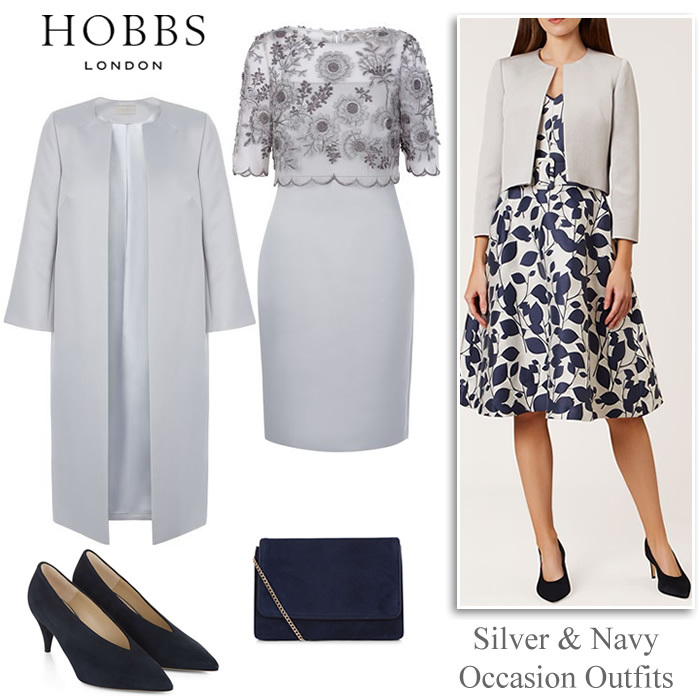 Hobbs occasionwear navy and silver Mother of the Bride and wedding guest outfits. Coordinating two piece styling includes the Anna edge to edge collarless coat crafted from stretch satin. Wear with matching lace shift dress. For an alternative look style the Elize boxy textured jacket with floral print fit and flare dress. 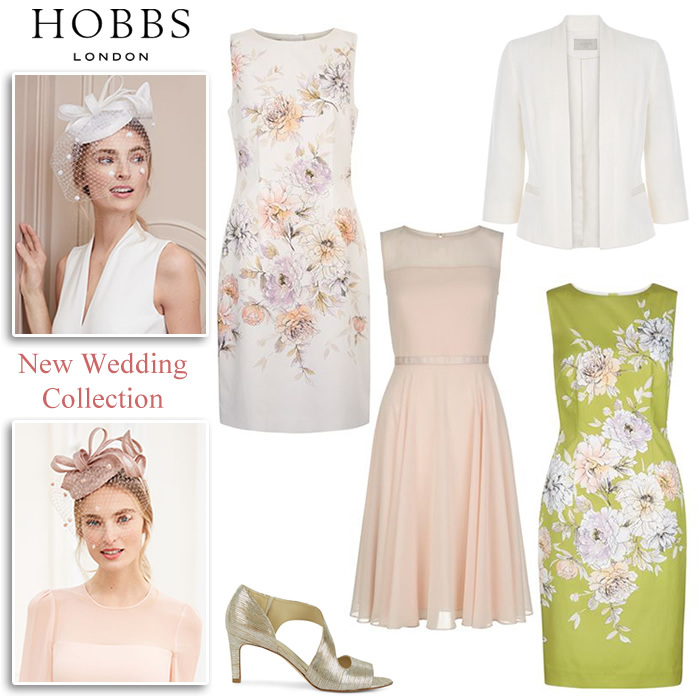 Hobbs new wedding collection for spring and summer. Seraphina latte cream lace dress is crafted in Italian ottoman fabric in a colourblock design. Complete your occasion look with matching jacket. The short sleeve Rhoda dress is elegantly embroidered in lemon, green, ivory and black with contrasting lace trim. Great for weddings, garden party events and race day. Style with metallic heels and and clutch. 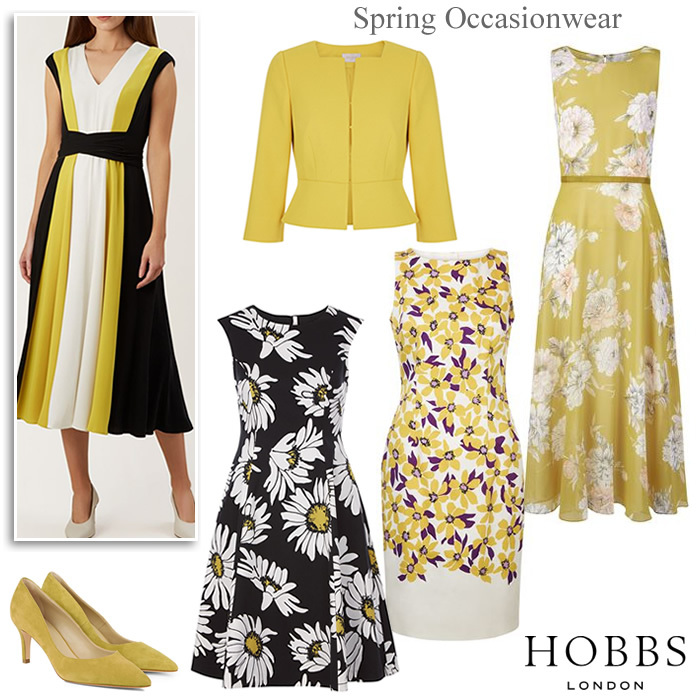 Hobbs coordinating occasionwear and modern Mother of the Bride dress suits. 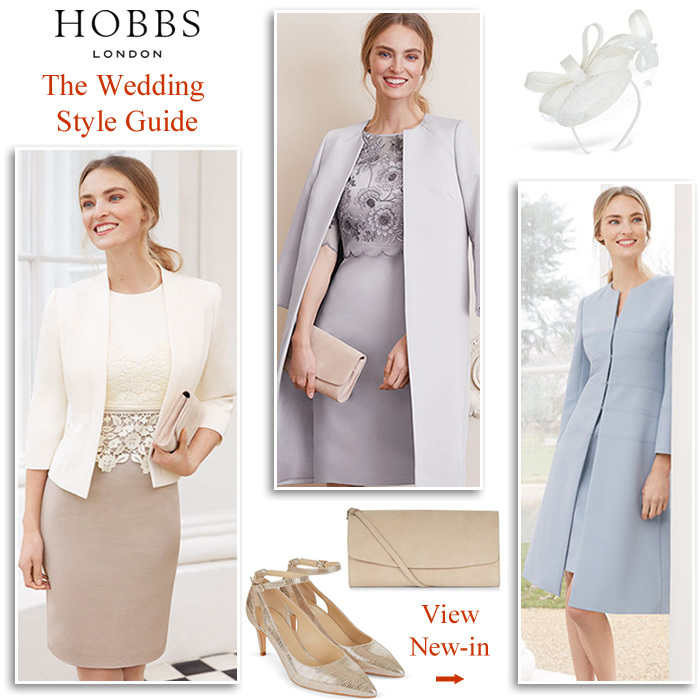 The Jenny coat and matching dress gives an elegant well suited wedding look. For evening events style with navy lace dress with sky blue lining. 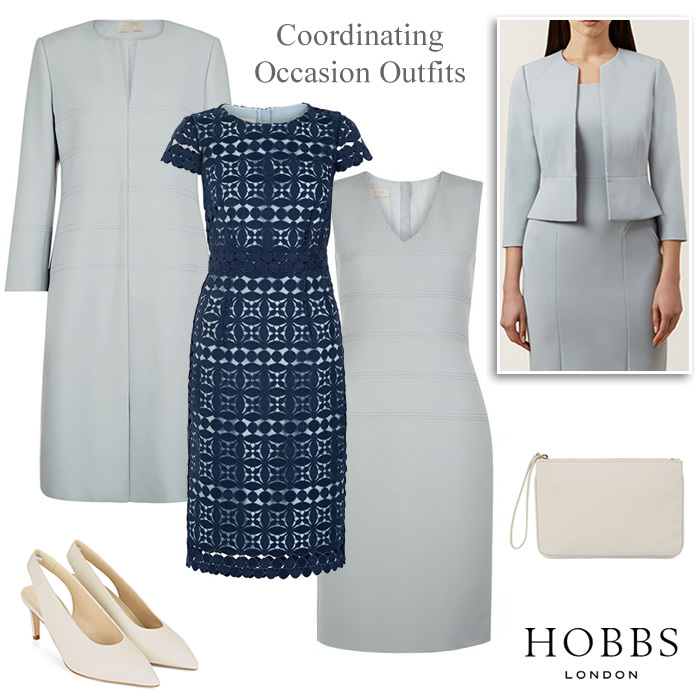 Get inspired with SS19 Hobbs occasionwear in midnight navy, ivory and cerise. New-in jewel embellished Arizona dress, Laurie colourblock dress both with matching occasion jackets. Isabella fit and flare dress with botanical print bodice and Sienna sleeveless dress with ribbon belt. 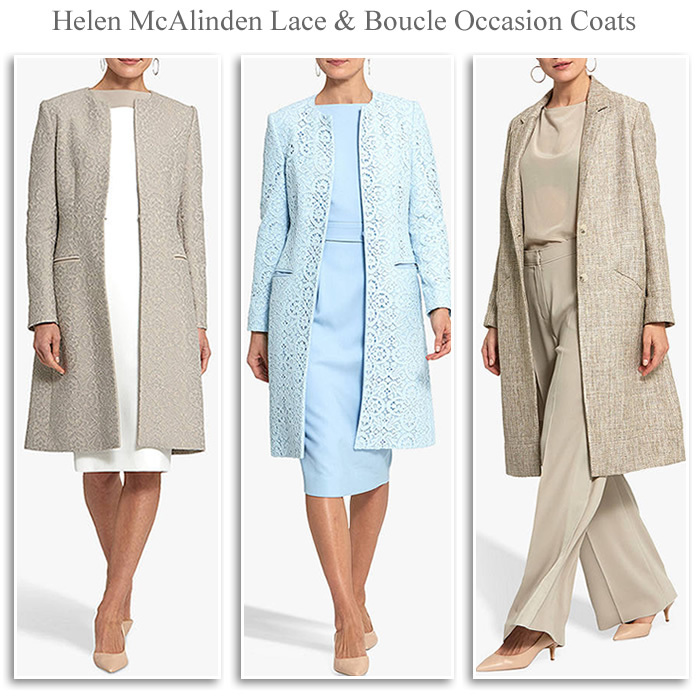 Helen McAlinden new season occasionwear. Blue mink and gold occasion coats in lux lace and boucle fabric. Edge to edge tailored coats layer impeccably over coordinating dresses. The Double breasted coat offers a relaxed casual silhouette that looks great with dressy trousers. 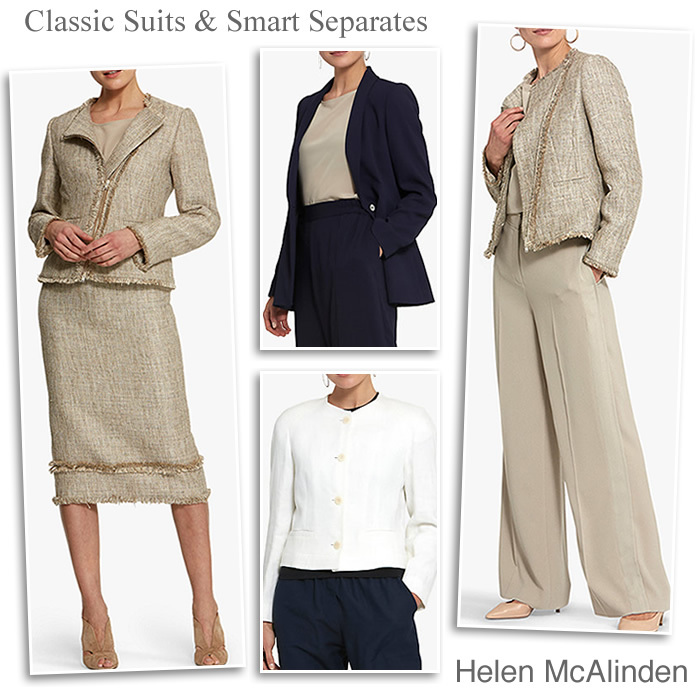 Helen McAlinden designer tweed pencil skirt and trouser suits in navy, beige and cream. Features include boucle texture with fringed detail at cuffs, neckline and hem. Tailored occasion jackets coordinating wide leg trousers and silk tops. 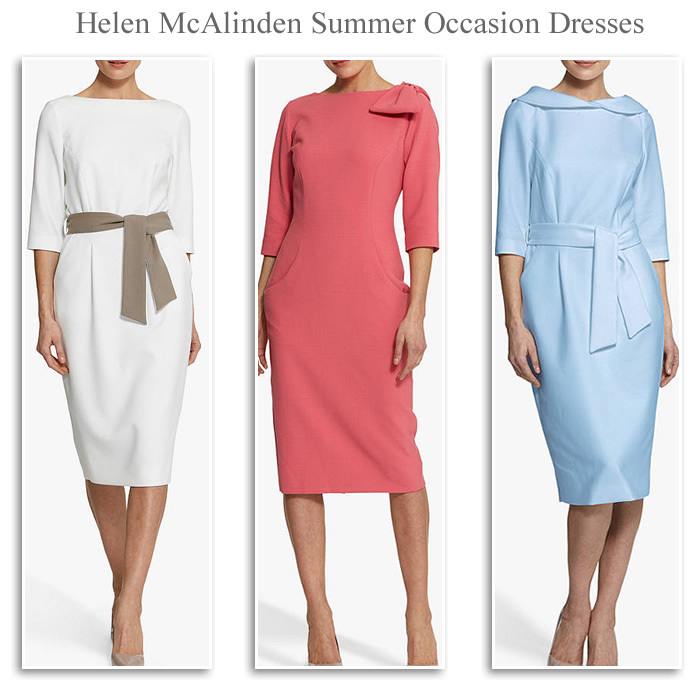 Helen McAlinden occasion dresses for a summer wedding, garden parties and MOTB. Pencil shape and 50’s inspired vintage shift dresses with off shoulder styling, bow detail and waist tie in pastel blue, cream and pink. Helen McAlinden designer occasionwear lemon cream pencil skirts dresses and matching occasion coat with decorative buttons, fringed cuffs and frayed edges. Waterfall jackets and boucle texture jackets. 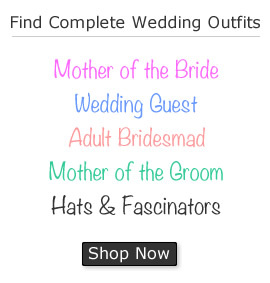 Modern Mother of the Bride wedding suits for 2019. 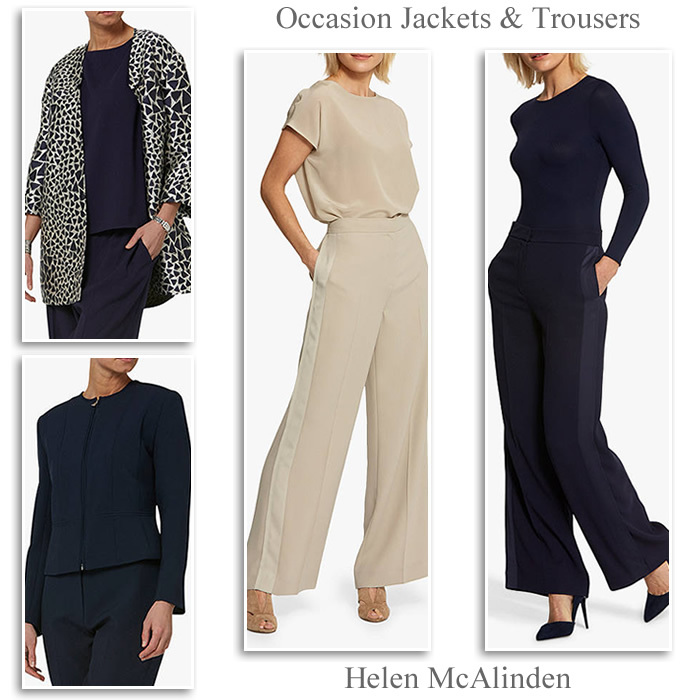 Helen McAlinden designer outfits wide and slim leg trousers, tailored trouser suits, relaxed kimono and smart jackets with skirts to match. 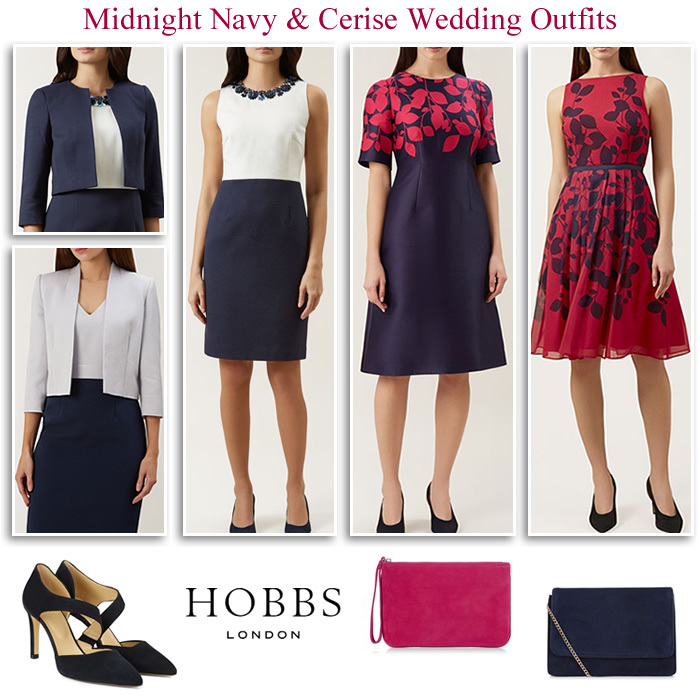 Navy and cream mix and match separates for modern other of the Bride and wedding guests. 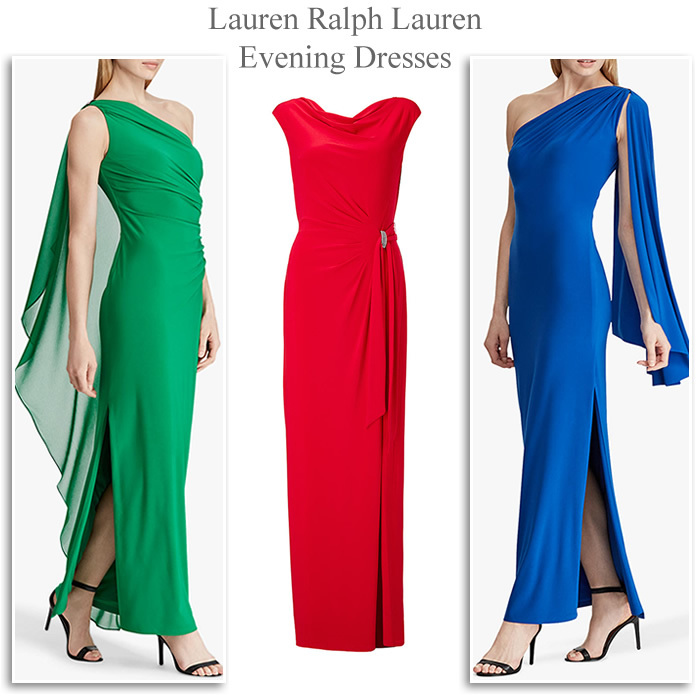 Lauren Ralph Lauren designer evening gowns. Green and blue one shoulder maxi dresses in soft flowing style with cascading ruffles, cape detail and alluring side split. Figure flattering red occasion dress with cowl neckline, gathered side tie and diamante detailing. Elevate your look with sparkling stiletto sandals and clutch bag. 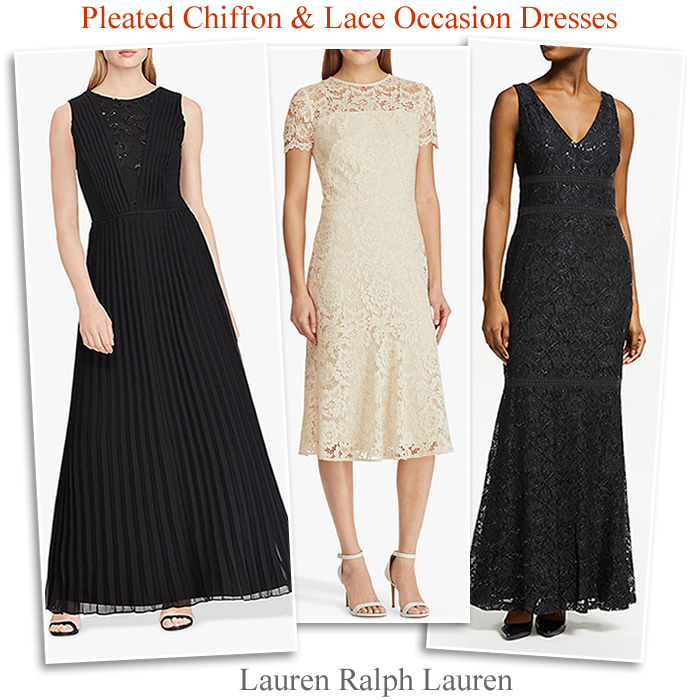 Lauren Ralph Lauren chiffon and lace cocktail dresses and evening gowns. Black sleeveless maxi dresses are adorned with sequins and embroidered detailing, feature deep V-neckline to the front and back, pleated flared skirts and fitted bodice. Short sleeve occasion dresses in cream come with fit and flare styling and contrast sheer lace finish to the shoulders and hem. 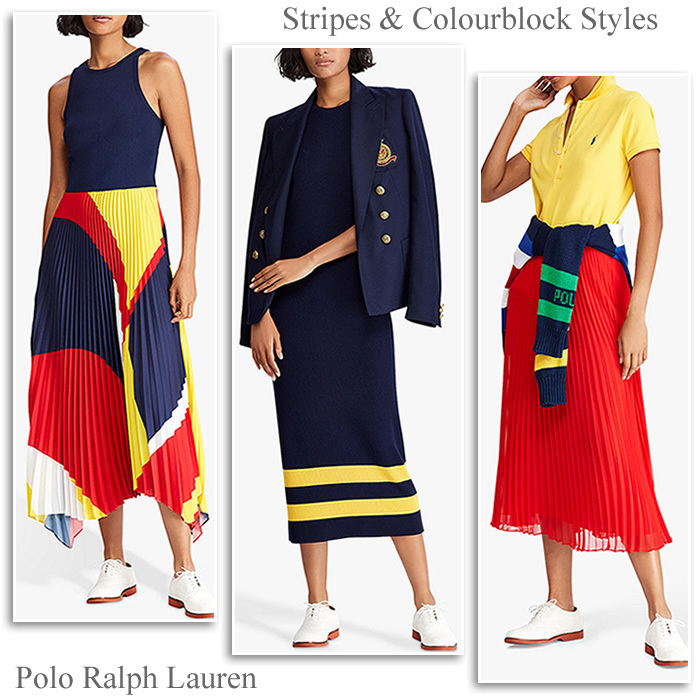 Polo Ralph Lauren designer collection in colourblock and stripes. 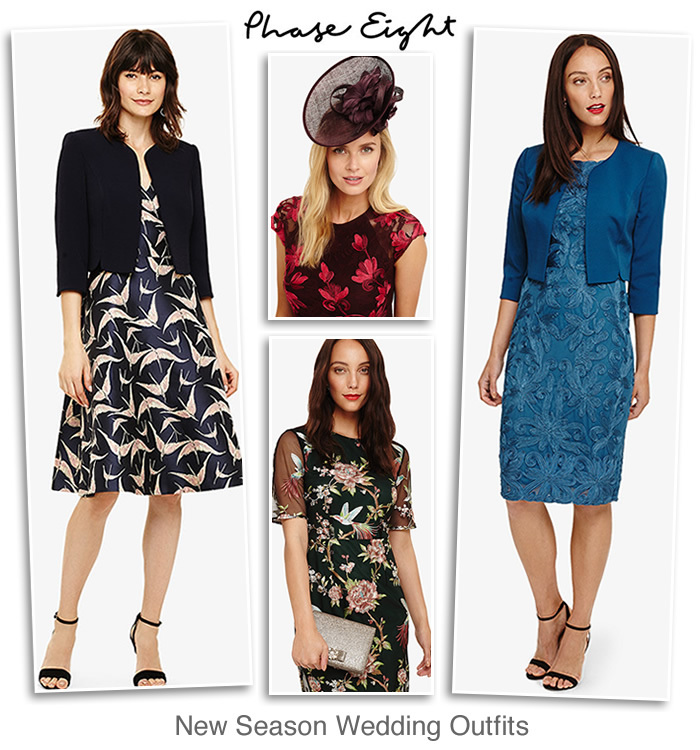 New season includes: Multi navy print dress with bold abstract print A-line skirt and fitted sleeveless bodice. Merino wool dress with ribbed texture and vibrant contrast gold stripes. Pleated georgette midi skirts in red, iconic polo shirts and blazers. 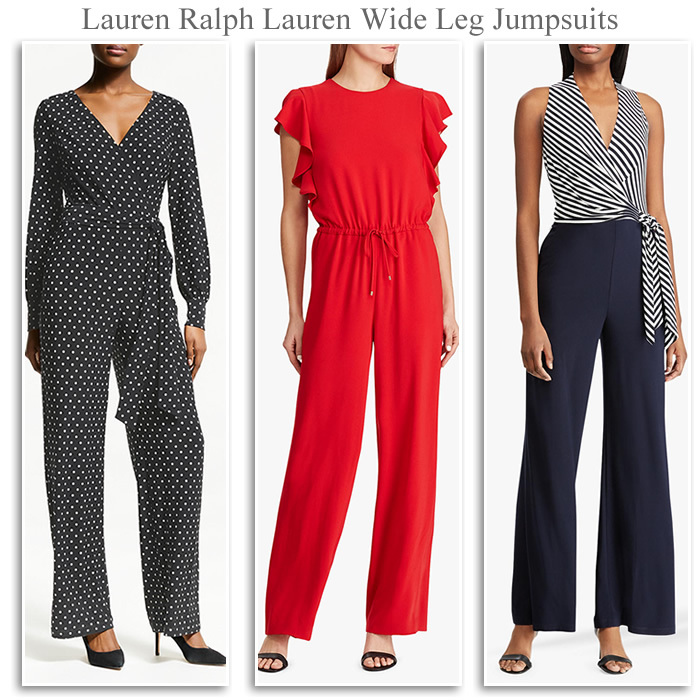 Lauren Ralph Lauren wide leg dressy jumpsuits in navy and cream stripes, black and white polka dots and red. New season include ruffle trim floaty jumpsuit with drawcord waist and side zip. A sleeveless style with striped wrap bodice and long sleeve tie belt flowing jumpsuit. Dress up with heels or sandals for a more relaxed look. 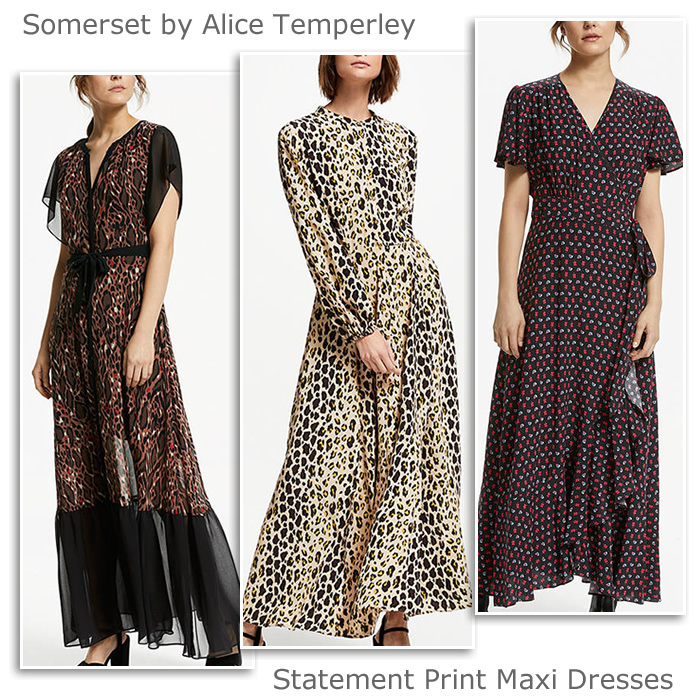 Somerset by Alice Temperley maxi dresses with high neckline, tie waist, wrap over design, sheer sleeves, frilled asymmetric skirt and ruffle hemline. In lightweight semi sheer fabric, leopard print and romantic mini heart prints. 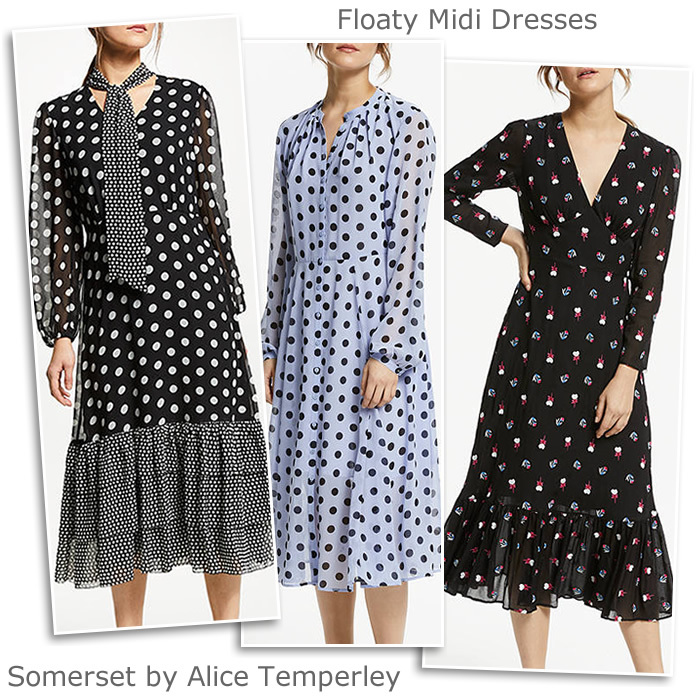 Somerset by Alice Temperley floaty midi dresses with sleeves. Tie neck dot dress, Blue black spot button through dress with flowing skirt, Vintage style floral dress with dropped ruffle hem. 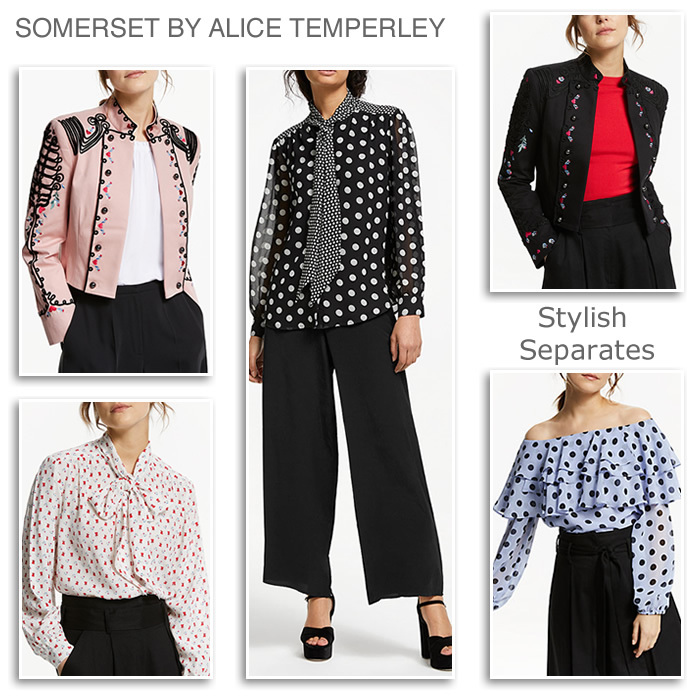 Somerset by Alice Temperley designer collection of stylish separates for 2019. Wide leg culottes, frilly bohemian style tops, vintage tie bow blouses and embroidered military jackets with bead detailing. 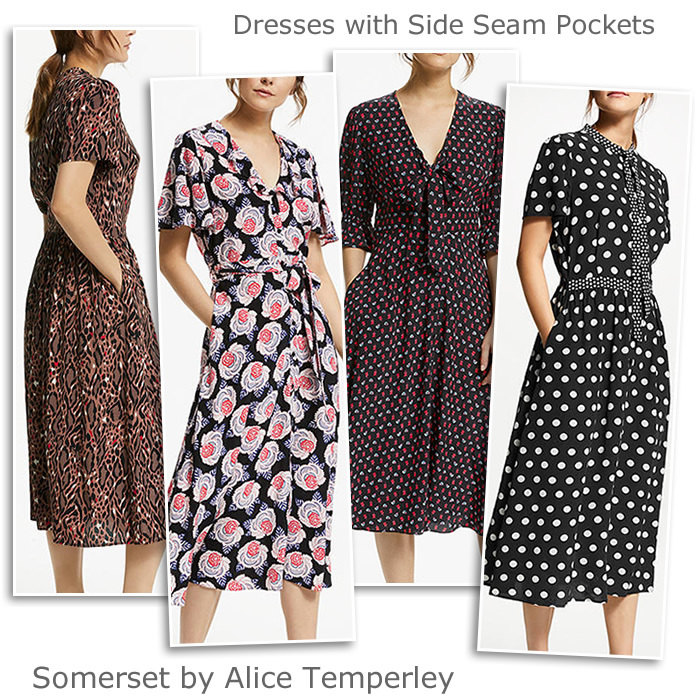 Somerset by Alice Temperley dresses with side seam pockets, black and white dots, animal prints ditzy florals. SS19 collections feature retro inspired tie neck and waist detail, puffed sleeves, lightweight woven fabric and elegant drape. Chesca plus size occasion trouser suits for Mother of the Bride or Groom. 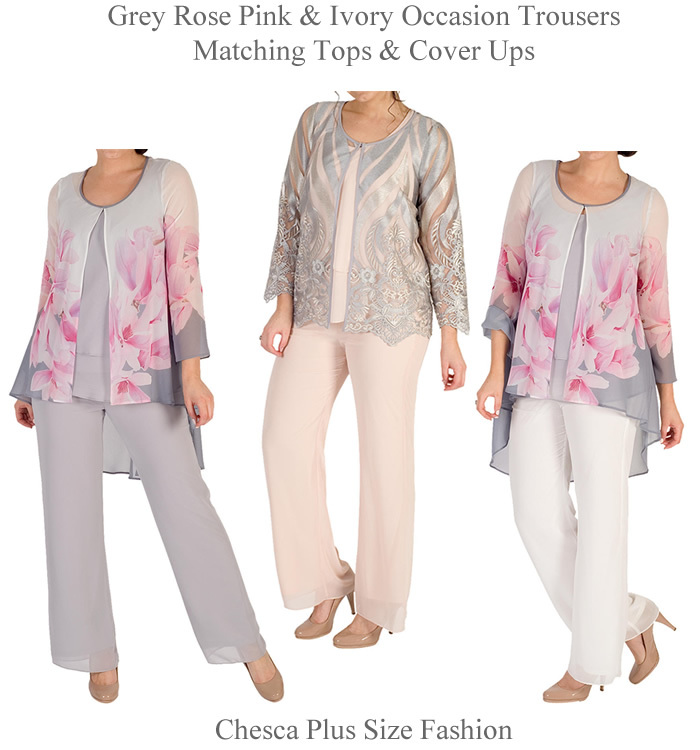 New-in wide leg trousers matching sheer cami tops and floral lace coats. Colours come in black yellow and ivory, navy, blond and black monotones. Features include fluted sleeves, dipped hem, embroidered scallop trim and sequins. 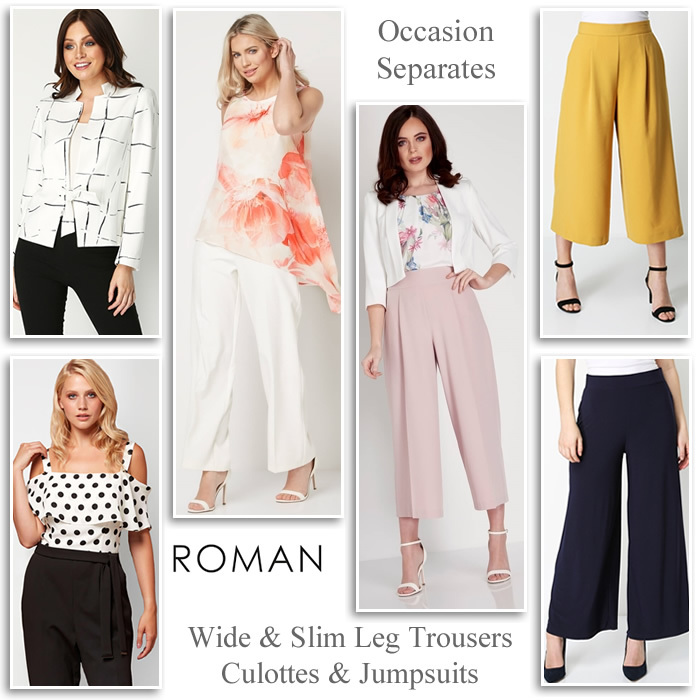 Roman Originals occasion trousers, trendy jumpsuits, evening wide leg culottes, slim trousers and smart jackets for Modern Mother of the Bride and wedding guests. 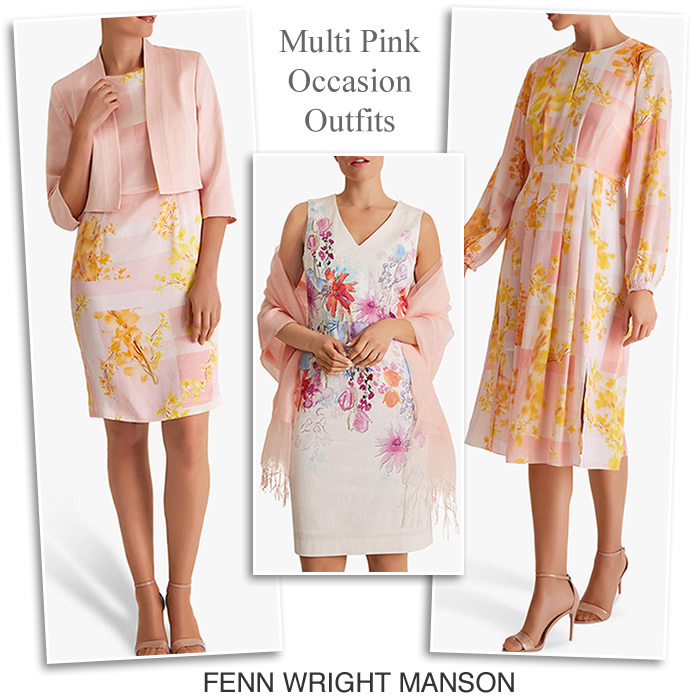 Fenn Wright Manson occasionwear and petite collection for spring and summer weddings. Mother of the Bride trouser suits in rose pink and sky blue. Slim leg trousers matching jackets and coordinating tie bow blouses and tops. Chesca plus size Mother of the Bride trouser suits and evening trousers. New summer occasion outfits include ivory chiffon wide leg trousers, dove grey and rose pink matching tops, cover ups, jackets, fascinators, wedding bags and shoes. 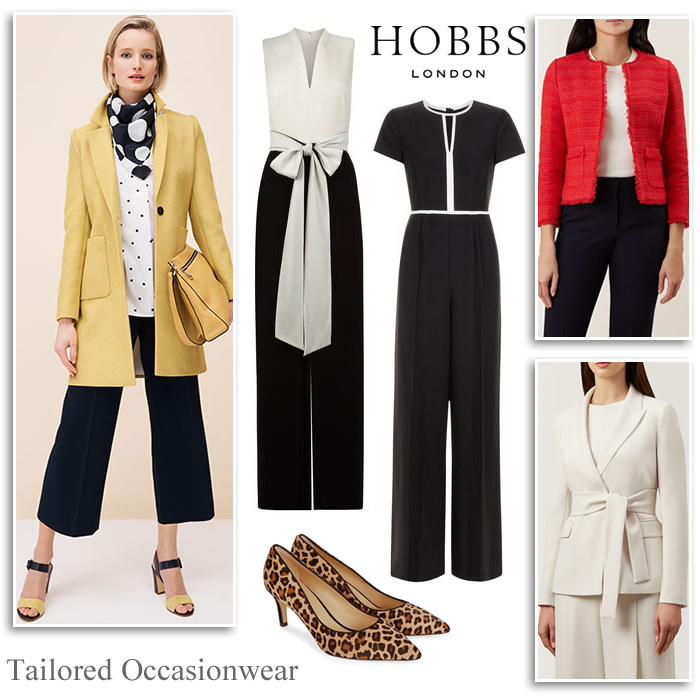 Hobbs occasionwear coats, jackets, jumpsuits, and dressy trouser suits. Dress for any occasion with new spring summer collections. 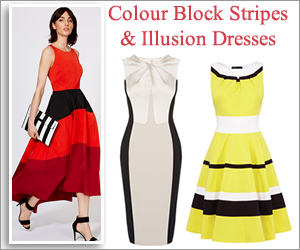 Coordinating pieces come in yellow, ivory, black and red. Complement your look with luxury heels like the leopard pointed toe court shoes. 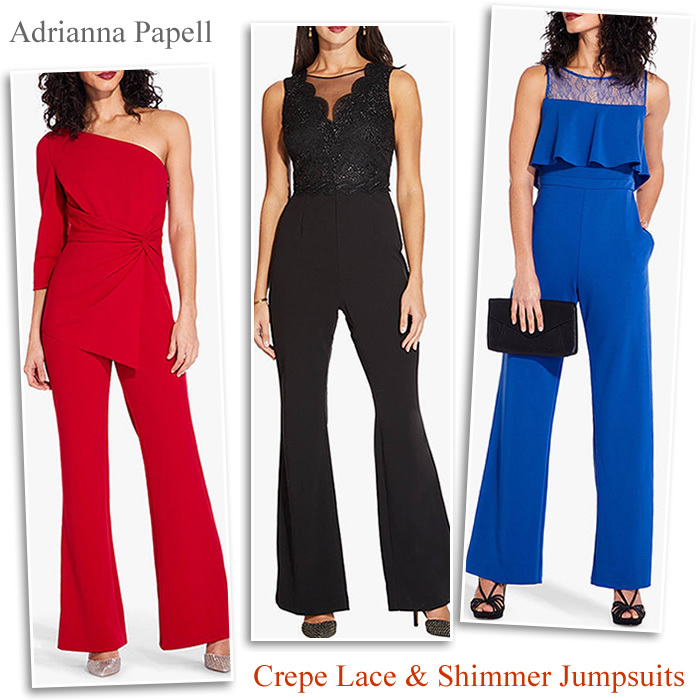 Adrianna Papell occasion jumpsuits modern Mother of the Bride designer eveningwear. 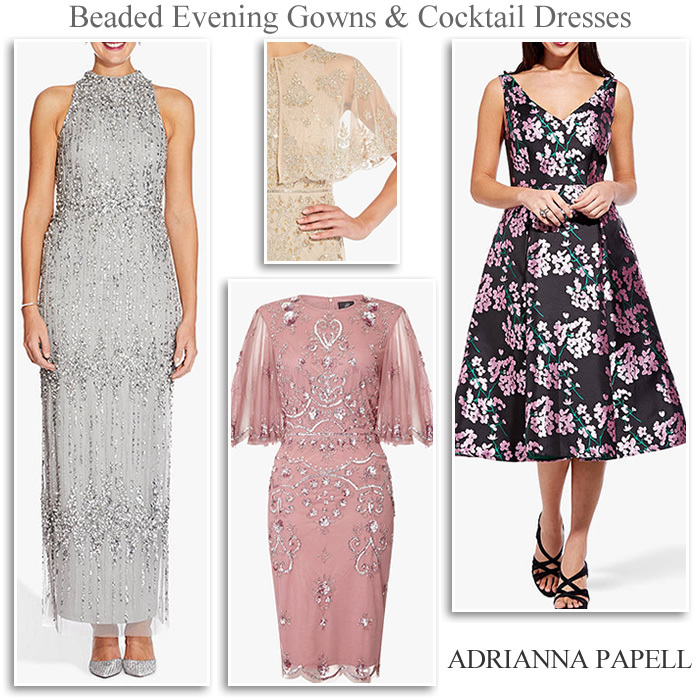 New season wedding styles include crepe, lace and shimmer fabric with glamorous wide leg. Metallic detailing and eye-catching ruffles. 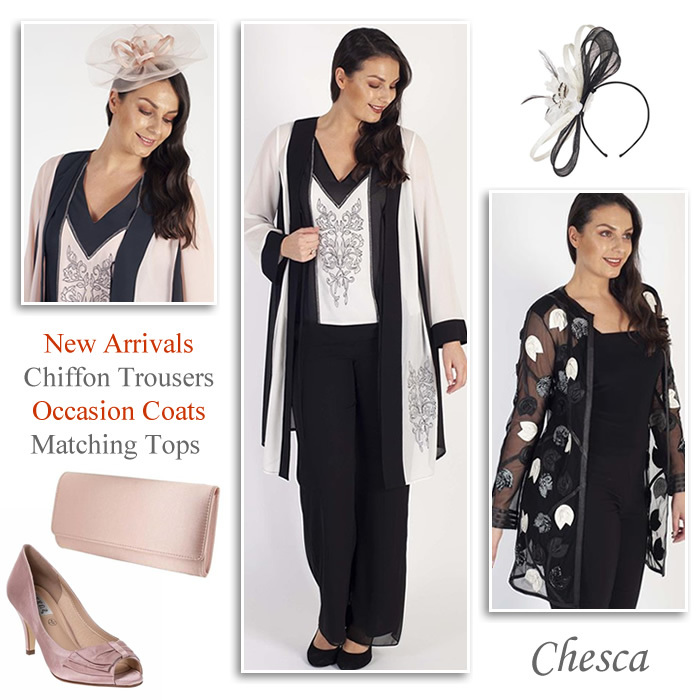 Chesca new season Mother of the Bride trouser suits, chiffon evening trousers, cami tops matching sheer occasion coats, hats, shoes and bags. Plus size wedding fashion. Pink, grey, navy, ivory complete occasionwear. 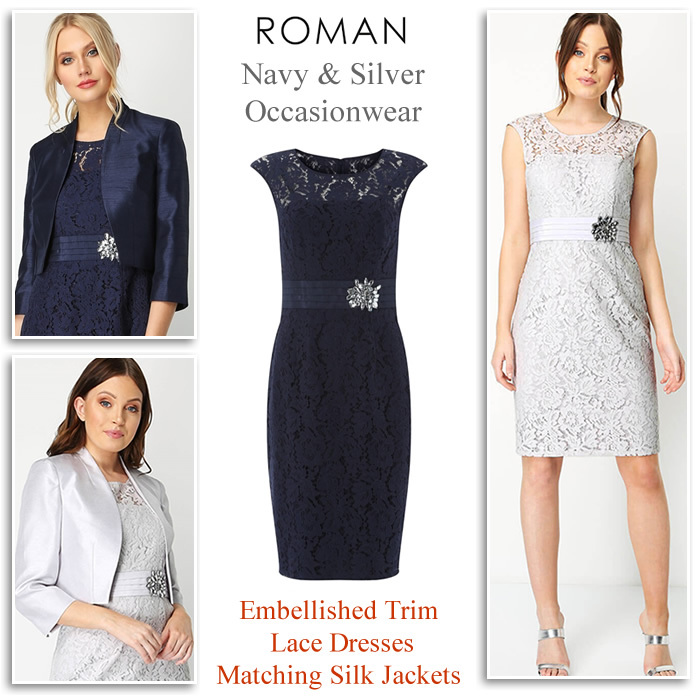 Roman Originals occasionwear Spring wedding guest and Modern Mother of the Bride matching outfits under £100. 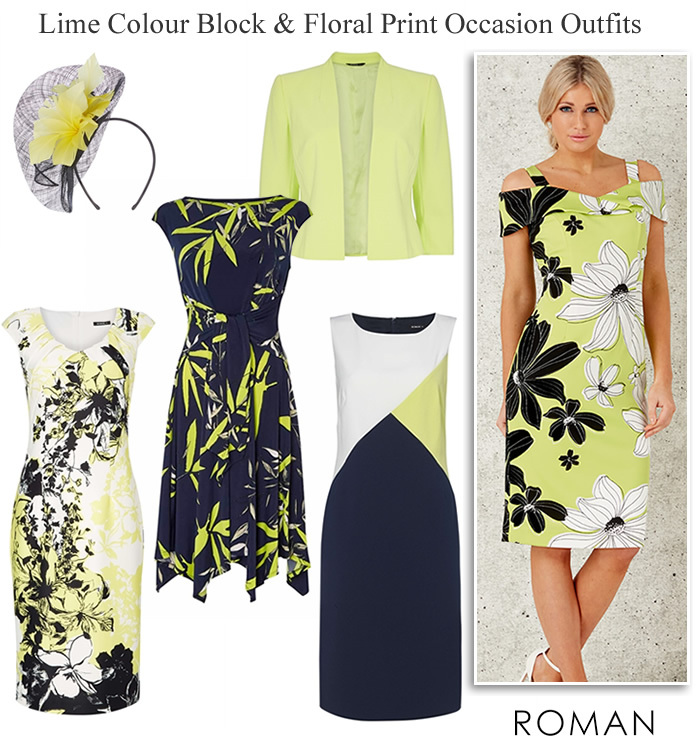 Elegant knee length shift cold shoulder and fit and flare colour block floral and print dresses in lime green, navy, black and ivory. Mother of the Bride Outfits at John Lewis. 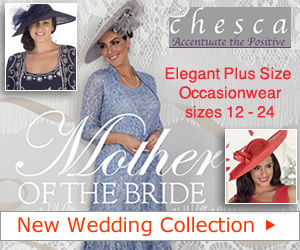 Complete wedding fashion for Mother of the Groom, guests and Bridesmaid dresses. 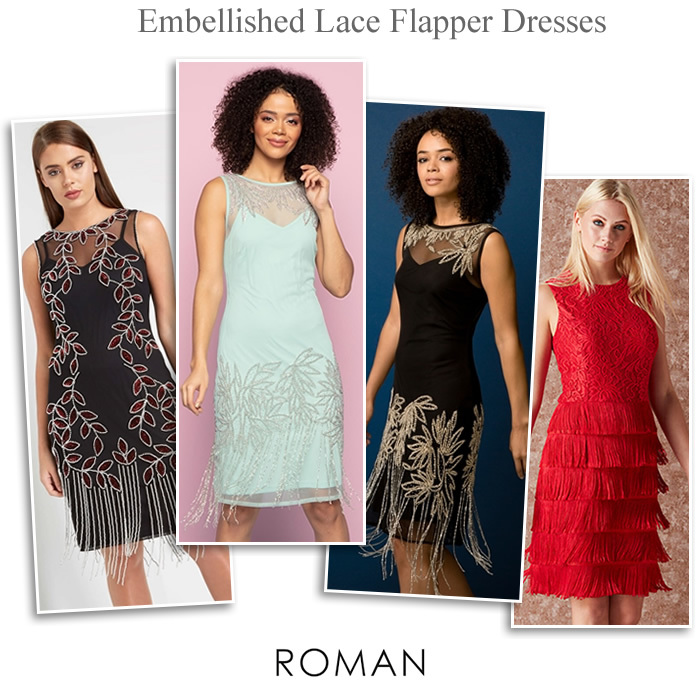 Spring and summer styles and all season occasionwear include elegant knee length lace shift dresses, statement hats, co-ordinating court shoes and clutch bags from much loved designer brands. 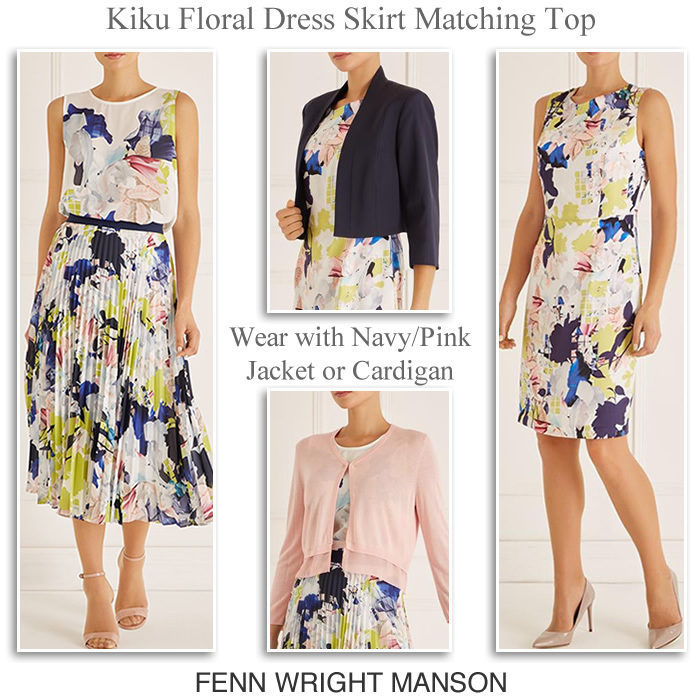 Fenn Wright Manson spring wedding occasionwear, dresses and occasion jackets. Fresh floral print dresses feature long or short sleeves and a neat fitted silhouette. For a polished finish style with a blue tailored textured jacket. L.K. 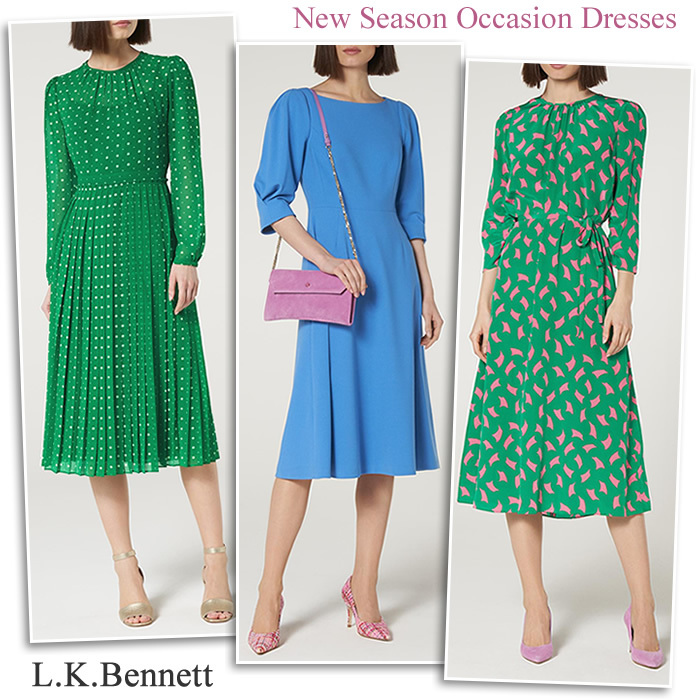 Bennett SS19 spring wedding outfits and modern Mother of the Bride dresses. 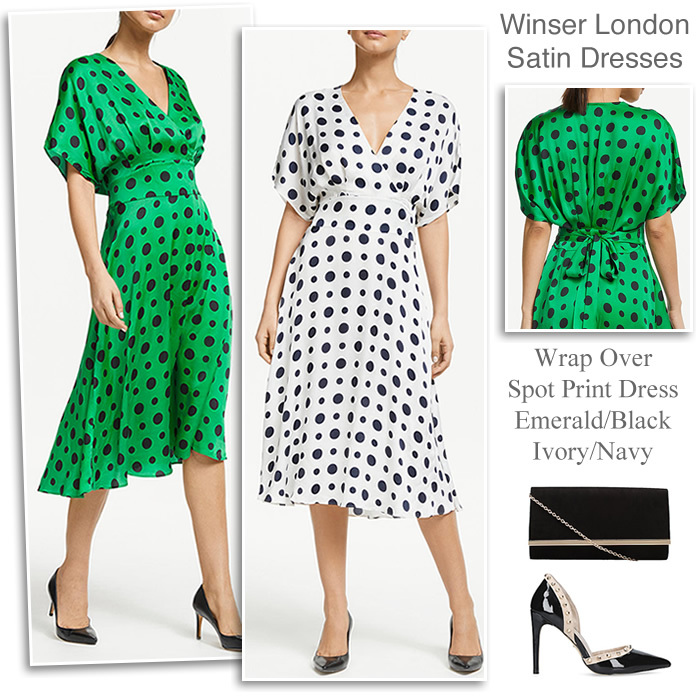 New-in midi dresses feature high neck, long sleeves and floaty skirts in green polka dots, blue and vintage inspired pink prints. Complement the mid length hem with pointed toe court shoes and colourful suede clutch. 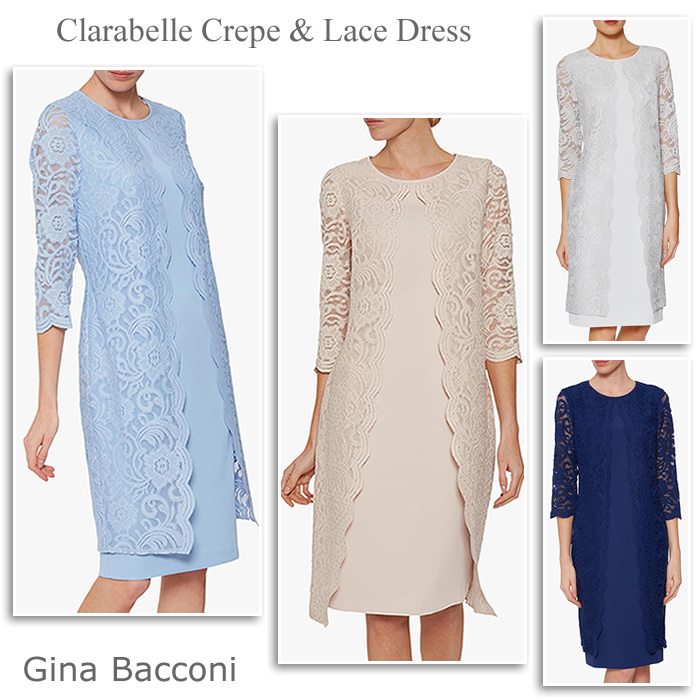 Gina Bacconi Clarabella crepe and lace dresses overlaid in a dainty floral lace opening at the front to look like a dress coat. 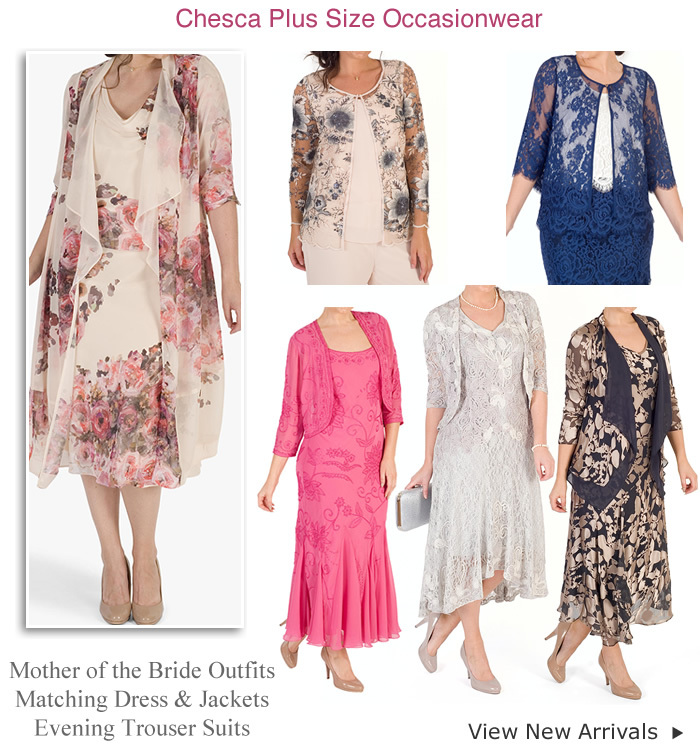 Mother of the Bride outfits in silver mist, antique rose, nordic blue and navy, semi-sheer lace sleeves and scalloped edges finish the design. 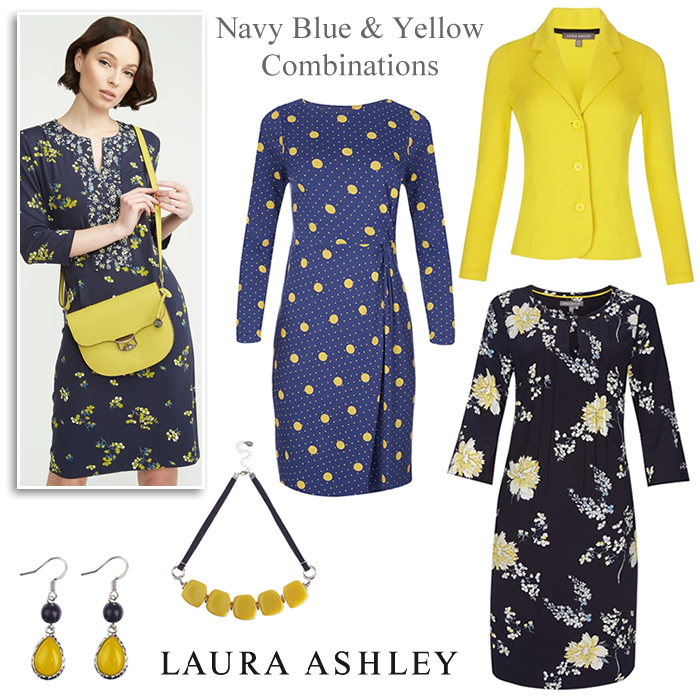 Laura Ashley navy blue and yellow outfits for spring summer occasions. 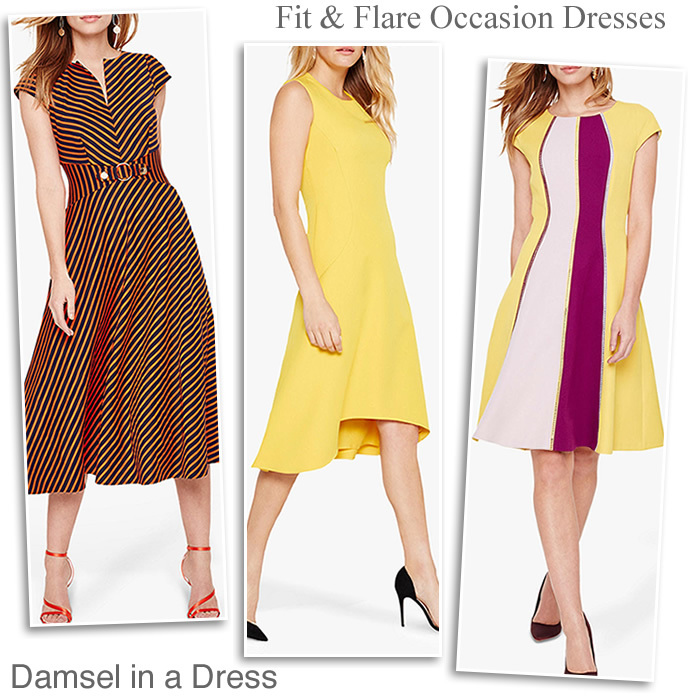 Smart day dresses feature bold and bright spot prints, flattering waist detail, fluted sleeves and florals. Coordinate with with eye-catching blazer, cross body bag and statement jewellery. 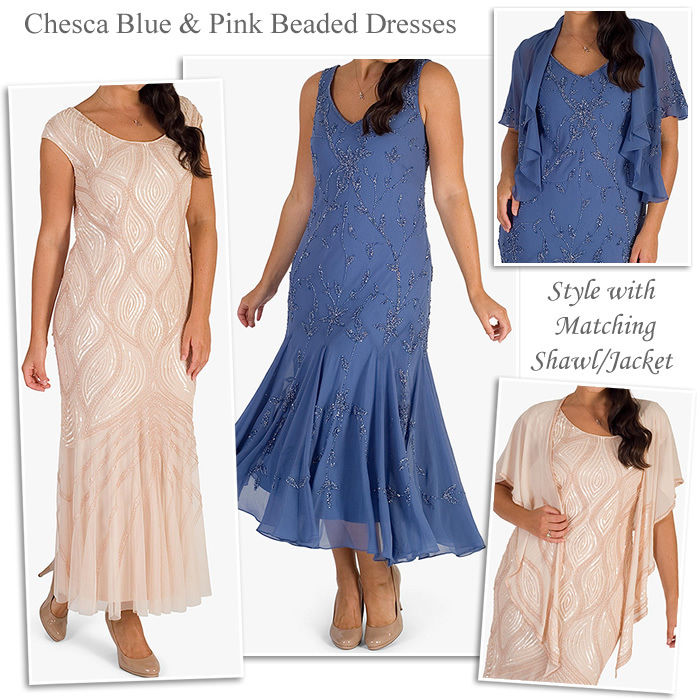 Chesca plus size spring summer 2019 Mother of the Bride wedding outfits. Blush pink embroidered sequin dress with a scoop neckline and fishtail hem. Wear on its own or with matching shawl. The iris blue evening dress features silver beads and bias cut skirt. Complete with chiffon short sleeve jacket. Introduce a fresh new silhouette with beautiful pieces from Hobbs new SS19 collection. 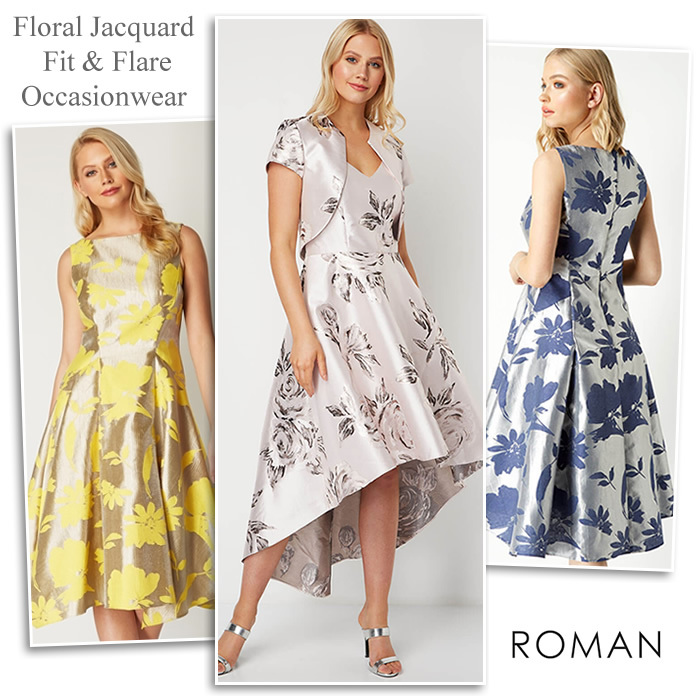 Fit and flare, shift and midi dresses in multi yellow florals and stripes are perfect for spring through to summer events. 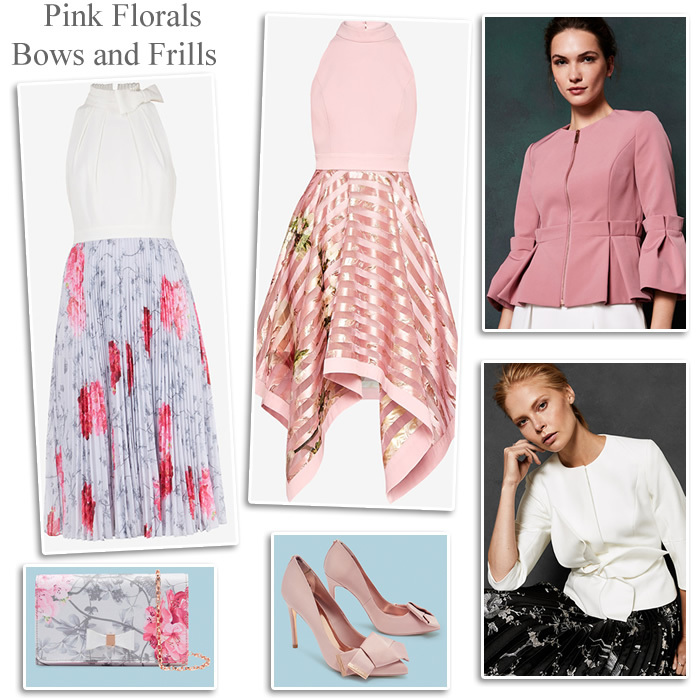 For a complete wedding outfit team with peplum style jacket and courts. Ted Baker occasionwear in pretty pink florals and bows. Elegant high neck dresses with bow detail, burnout-effect stripe skirt and ruffles offers an effortlessly stylish look. Add feminine layering with a structured blazer or tailored jacket. Features such as twisted bow and collarless neckline, peplum waist and frilled sleeves is sure to get you noticed. 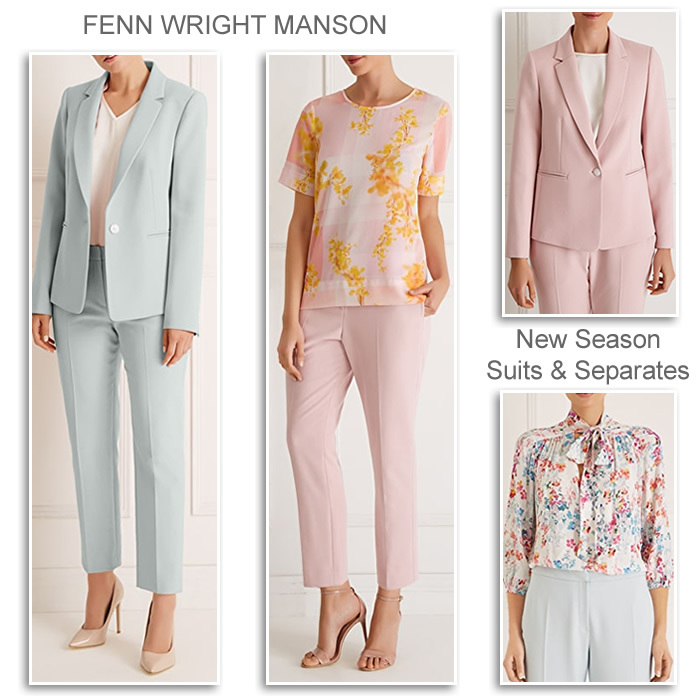 Fenn Wright Manson occasionwear and spring/summer wedding outfits. Kiku floral silk dress with flattering seam detail. Kiku sun-ray pleated skirt with elasticated waist matching dipped hem top. Style with the Lichtenstein navy occasion jacket or cropped Gaia pink cardigan. 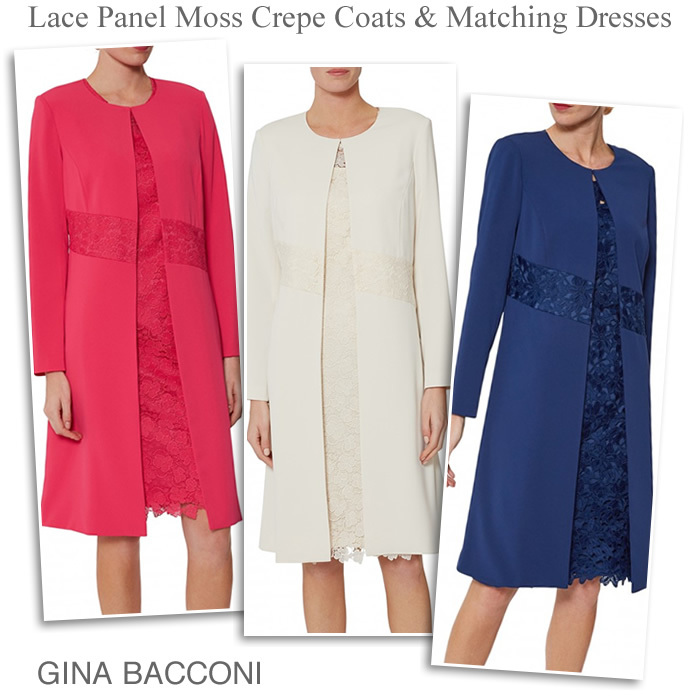 Gina Bacconi embellished crepe and lace dress and cape wedding outfits. Spring and summer plus size Mother of the Bride dresses in pastel blue, bright pink and antique rose. 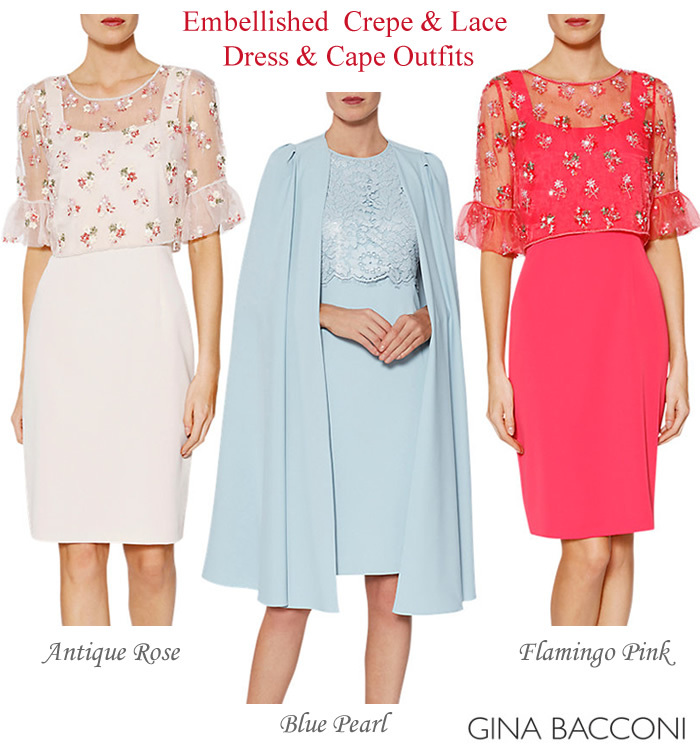 Beautifully tailored dresses come with a short or long length cape for a complete occasionwear look. 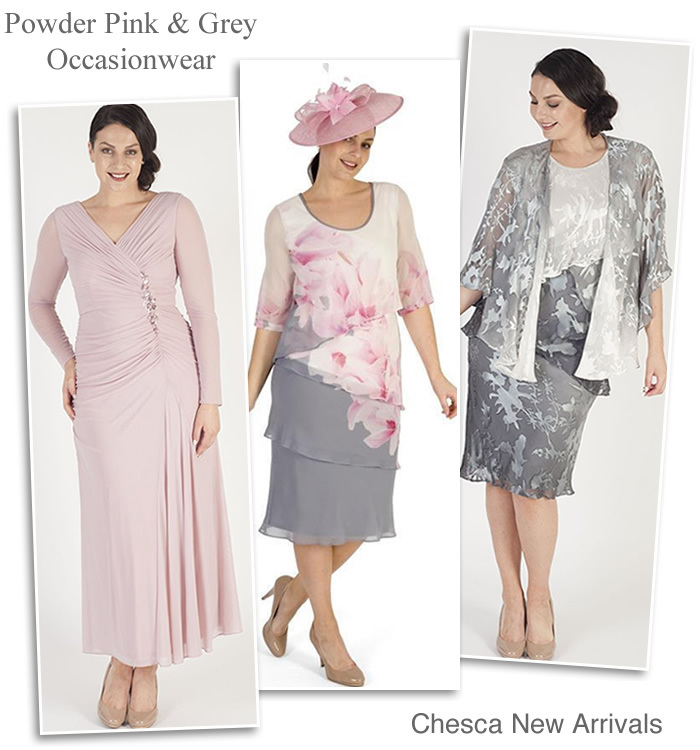 Flattering plus size Mother of the Bride outfits in powder pink, grey and ivory. 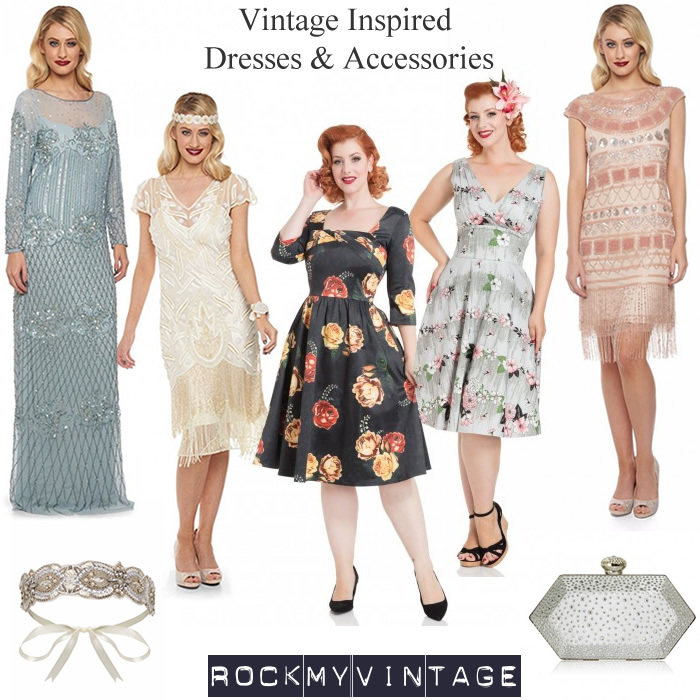 Wedding and occasion wear day and evening dresses, multi layered dress matching shrug, fascinators hats and bags. 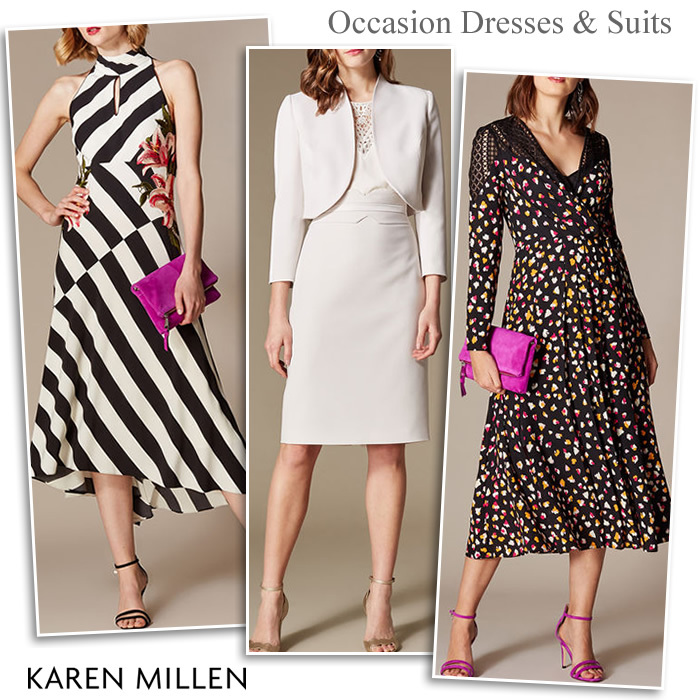 Karen Millen modern Mother of the Bride skirt suit with matching lace top in champagne, wedding guest midi dresses feature halter neck, black and white stripes, animal print, long sleeves and lace shoulder detail. 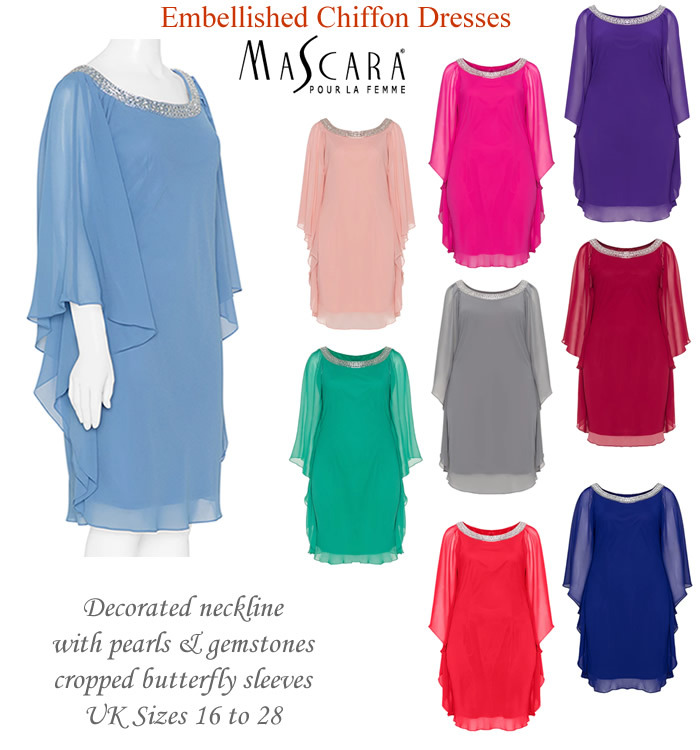 Mascara designer wear plus size embellished chiffon dresses in colours to suit all the seasons. Features include cropped butterfly and demi sheer batwing sleeves, knee length drape cut, decorated beaded round necklines, floaty and lightweight in red, light blue, pink, black, turquoise, bordeaux, navy, purple, dark green, grey and peach. 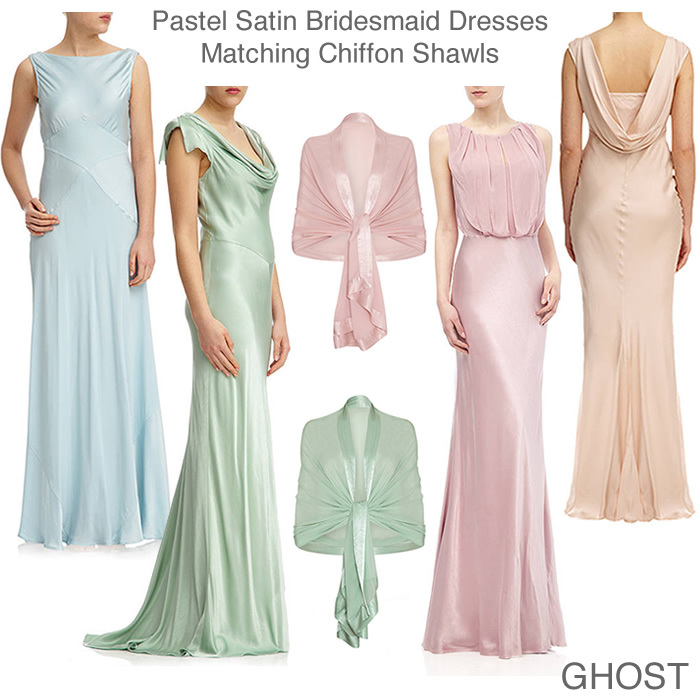 New summer Mother of the Bride, Groom wedding guest collection. 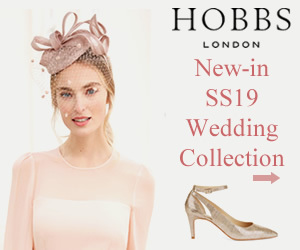 Hobbs occasionswear SS19 spring summer pastel wedding outfits Mother of the Bride or Groom, guests and bridesmaids dresses. 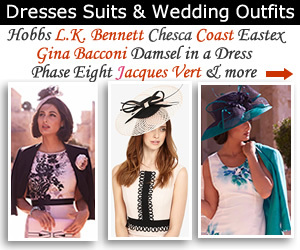 Dress suits, matching coats, occasion jackets shoes and fascinators. 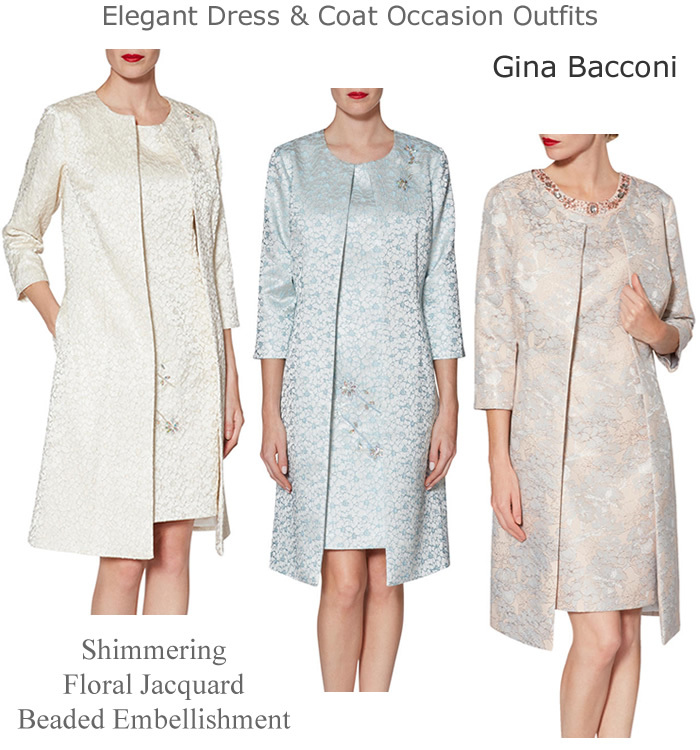 Gina Bacconi occasion coats with matching shift dresses in shimmering textured floral jacquard fabric and beaded embellished detail. 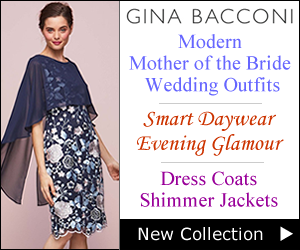 New season autumn winter Mother of the Bride Groom and wedding guest outfits. 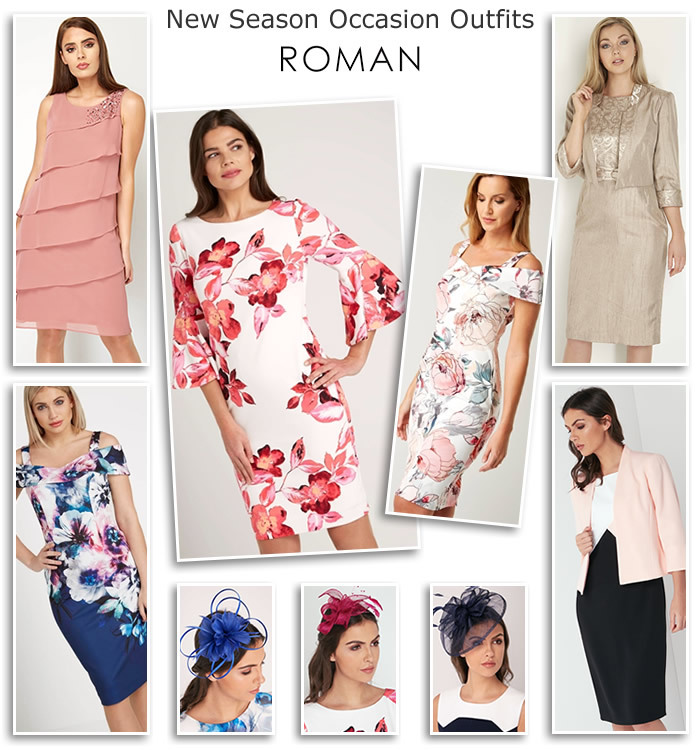 Roman occasionwear modern Mother of the Bride and Mother of the Groom outfits. 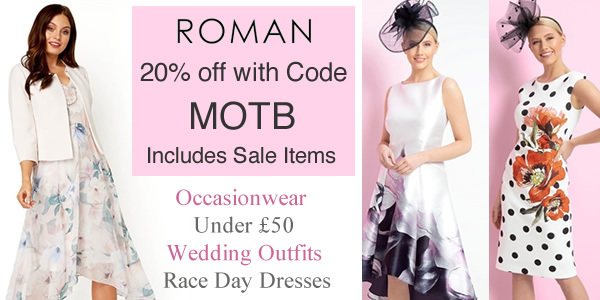 Affordable complete wedding fashion under £50 under £100. 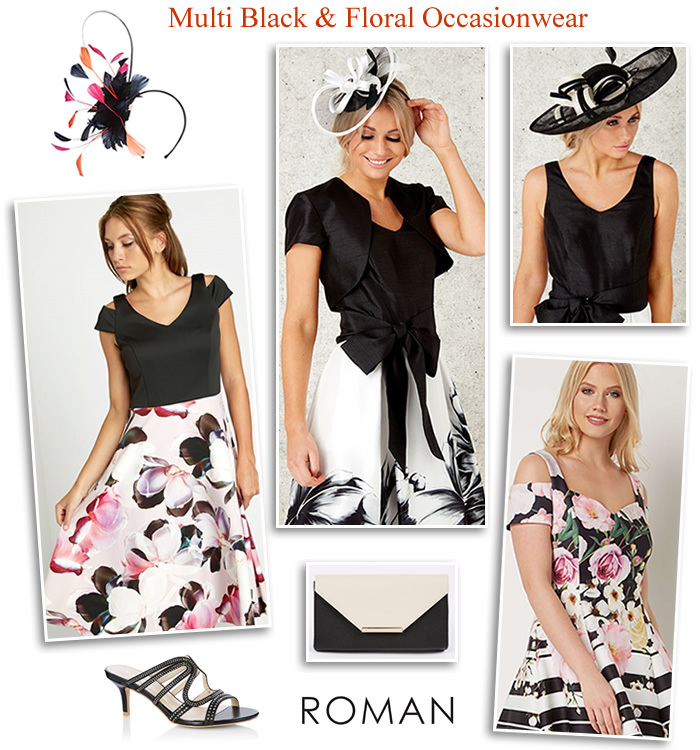 Stylish looks for a day at the races, formal events and autumn weddings. 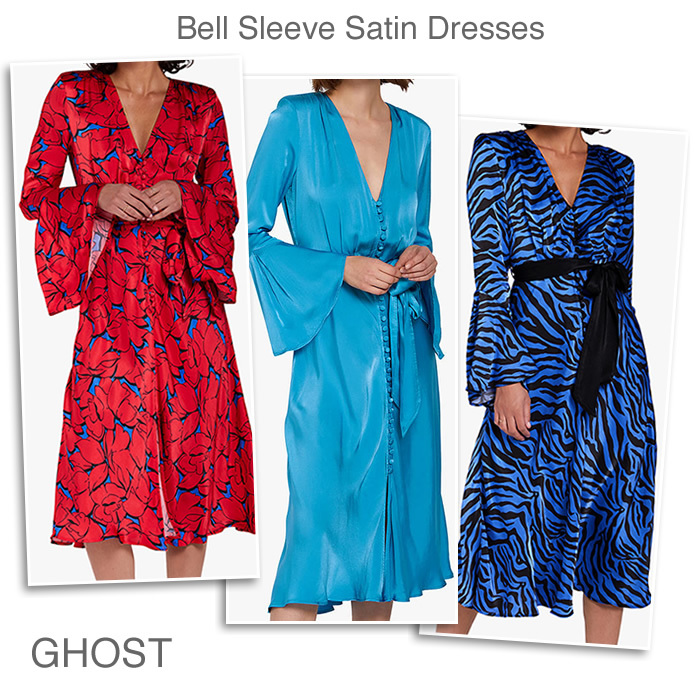 Knee length dresses with matching jackets, fascinators and fashionable styles feature cold shoulder tops, hanky hem and chiffon maxi length dresses. Shop by colour, special collections and latest trends including lace, floral, frills and ruffles. 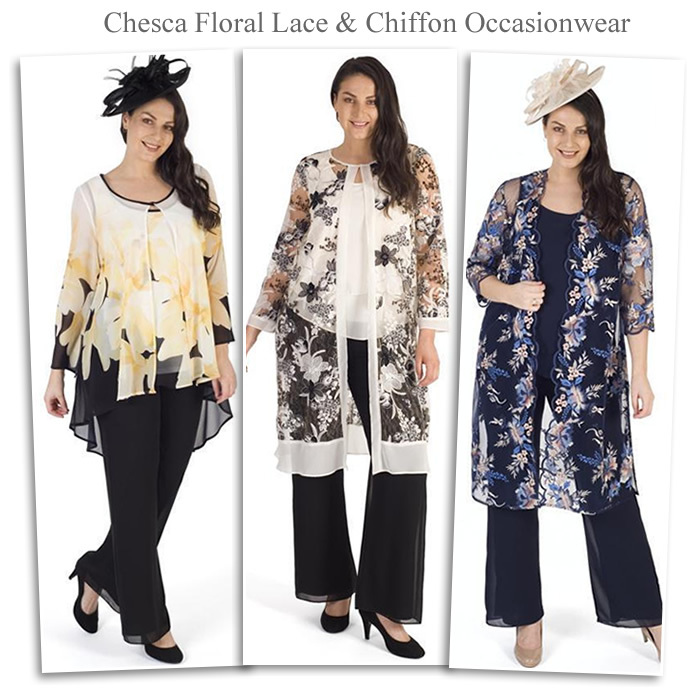 Chesca plus size occasionwear autumn winter wedding styles Mother of the Bride outfits in sizes 12 to 24. Mix and match skirts, tops, trousers, dresses and Jackets. New season colours in deep pink, navy, ivory and multi floral prints. 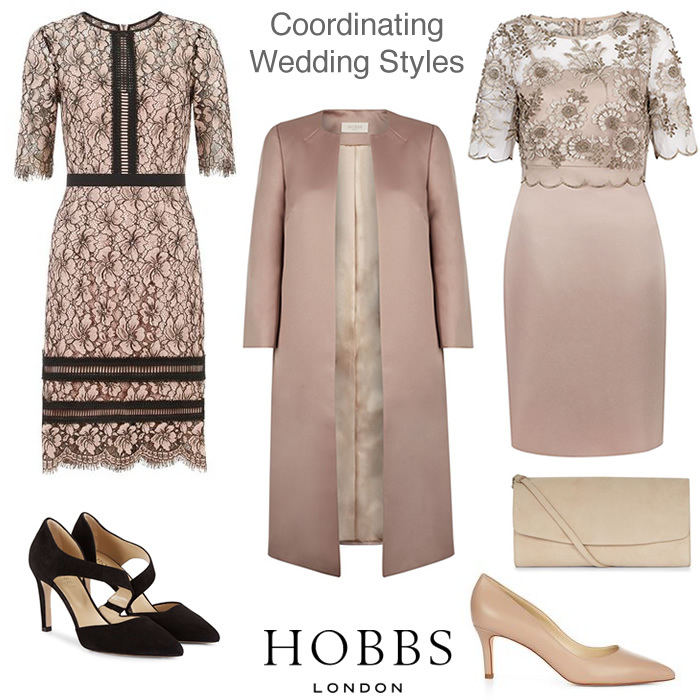 Hobbs complete occasion outfits in shades of mink black and pink. Sophisticated Mother of the Bride two piece outfit includes the Anna edge to edge collarless coat crafted from stretch satin. Wear with matching lace shift dress. 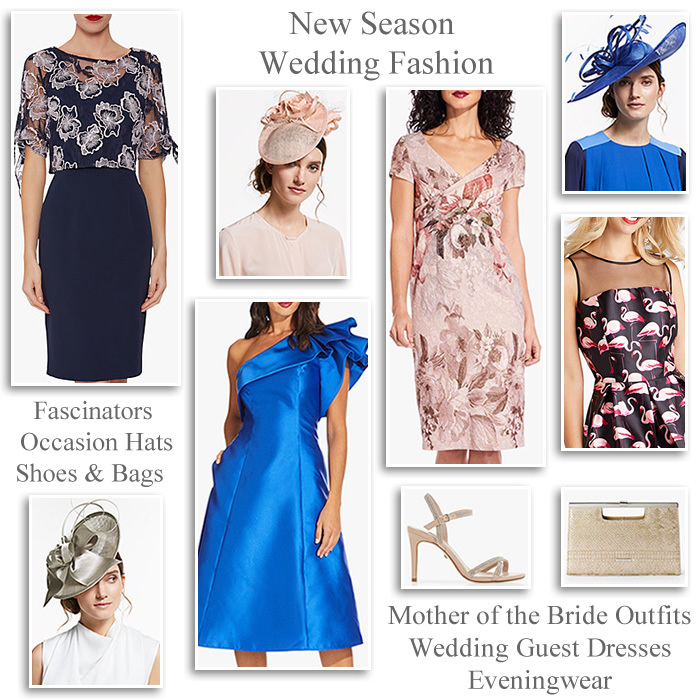 Fenn Wright Manson Mother of the Bride autumn wedding occasionwear. 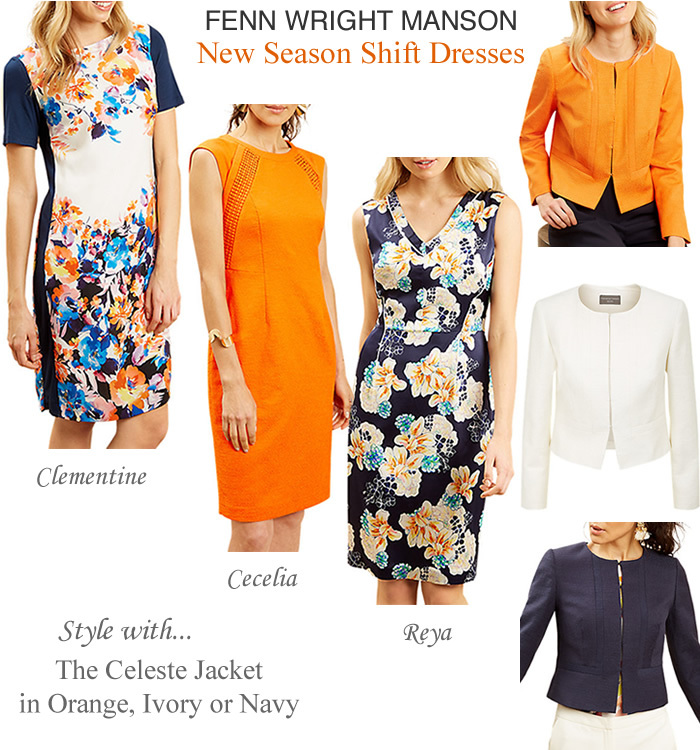 Shift dress and jacket outfits in orange, ivory and navy. The Clementine is a slimming style with contrasting side panels and colourful print. Cecelia is a beautiful bright creation with delicate lace detailing. The Reya is a real crowd pleaser made from silky fabric in blue and orange hues. Compliment each dress with the Celeste jacket for coordinated elegance. 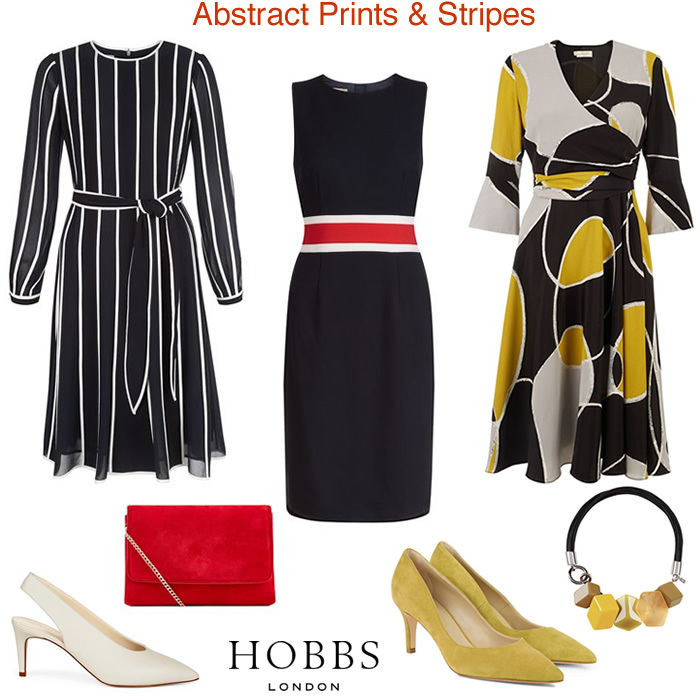 Hobbs abstract print, colourblock and stripe dresses in mustard yellow, black and ivory. Fit and flare, shift and long sleeve styles. 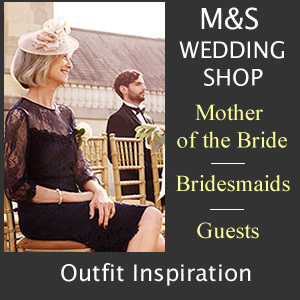 Modern Mother of the Bride dress suits and complete wedding outfits to match. 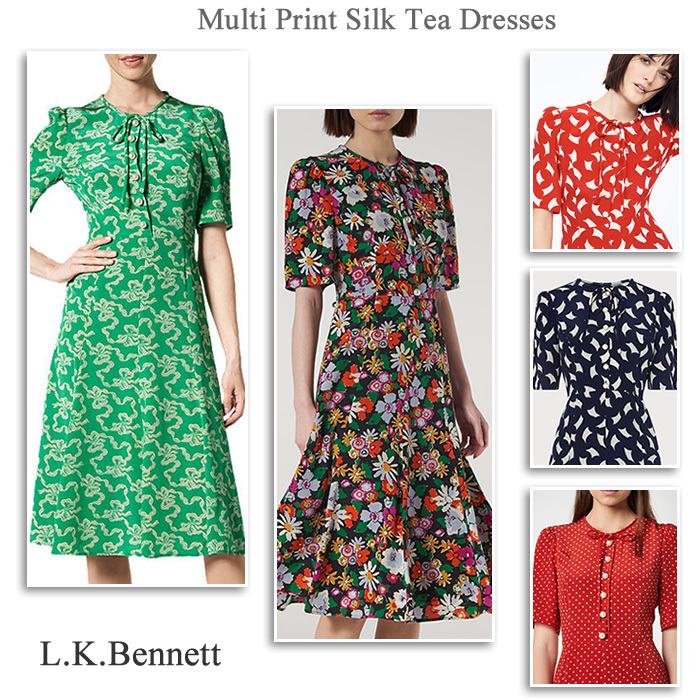 L. K. Bennett vintage occasionwear. 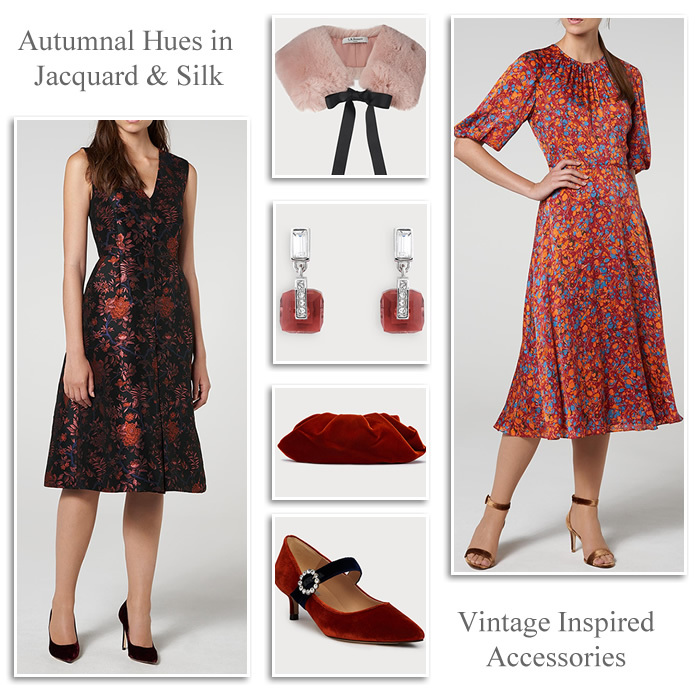 Autumnal hues in jacquard and silk is a luxe combination hard to resist. Rich textures and warm tones bring a sophisticated look perfect for a autumn winter wedding. Midi dresses come in rust marble prints and black pink floral designs to complement vintage inspired accessories. Team with burnt orange velvet kitten heel courts and matching pouch bag. 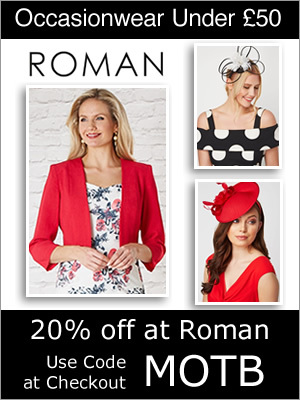 Roman Originals occasionwear winter wedding outfits and Mother of the Bride dresses and jackets under £50. 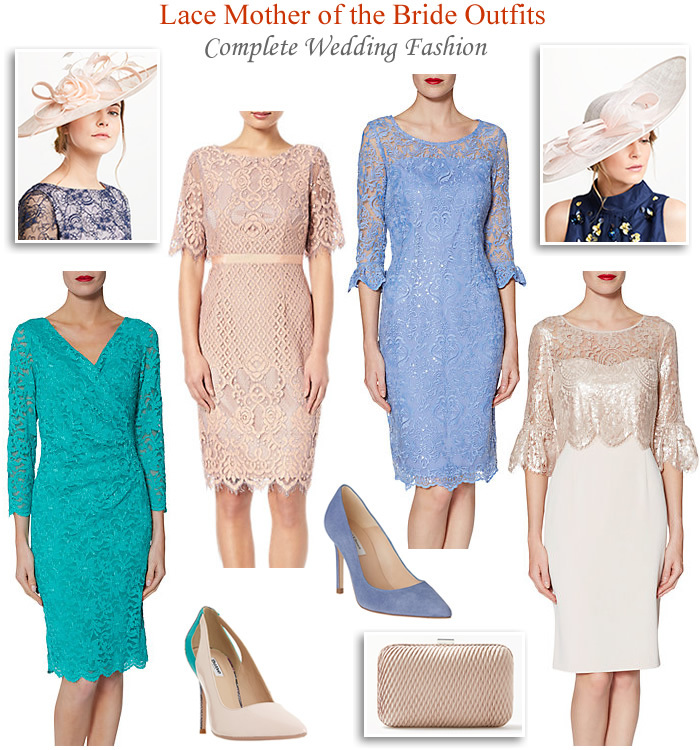 Complete wedding styles with hats shoes and bags under £100. New season shades in monochrome black, white and ivory florals and stripes, fit and flare skirts and cold shoulder tops. 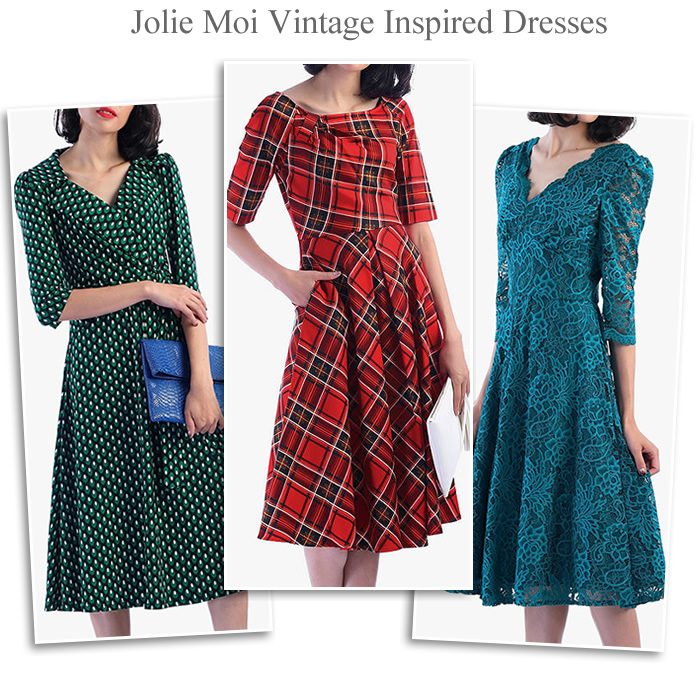 Jolie Moi occasionwear, vintage inspired and modern Mother of the Bride outfits. 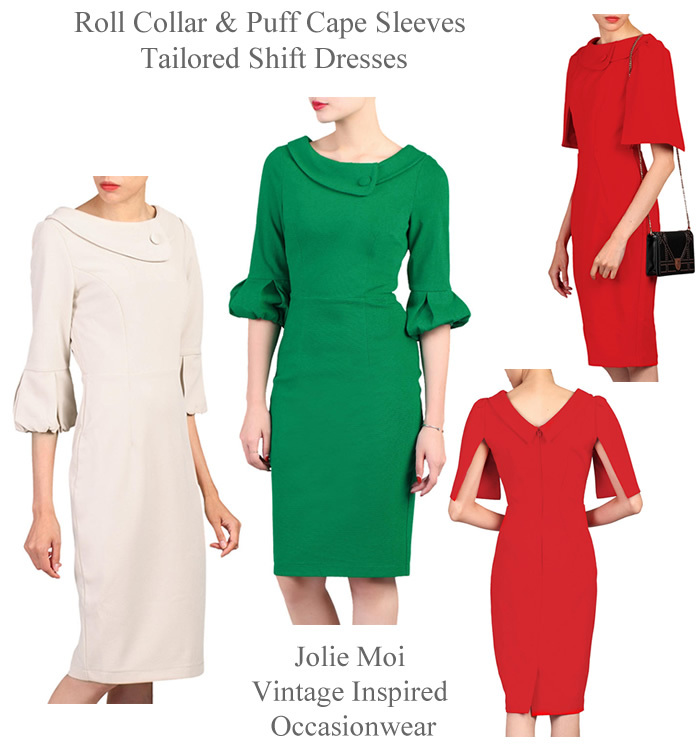 Autumn and winter wedding styles include elegant wrap over collar shift dresses with puff cape and bell sleeves in bright green, navy, beige and red. Feminine floral and lace prom dress styles from V by Very. 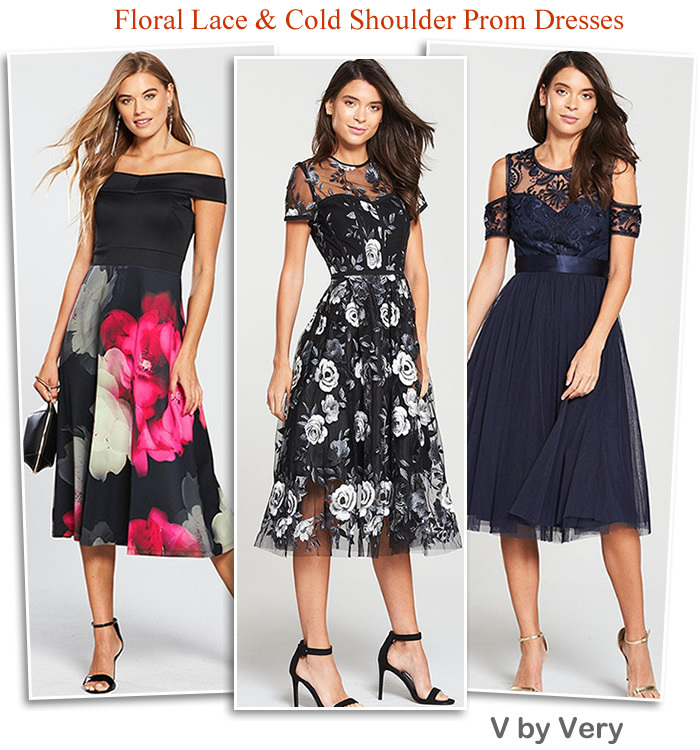 Elegant midi party dresses for the most special occasions come with cold shoulder styling, fitted bodice, bardot necklines, tulle underskirts and shimmering fabrics. In navy tones, monochrome and vibrant floral prints tap just add your favourite heels and matching clutch bag. Hobbs Multi pink and black occasionwear. 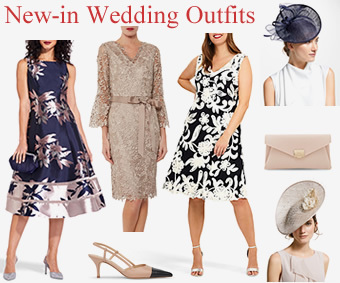 New season wedding outfits include a stripe fit and flare dress with netted underskirt and colourblock shift dress with lace trim bodice. Coordinate your look with an elegant pink or black lace jacket. 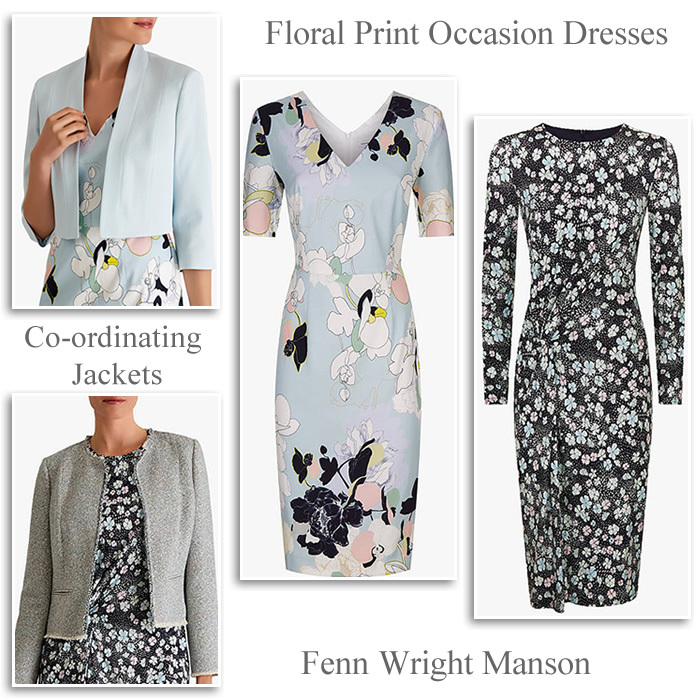 Fenn Wright Manson occasionwear dresses and jackets. Add some rich textures, luxury fabrics and unique prints to your going out wardrobe. Autumn and winter occasion outfits come in bold colours, stripes and florals. The chiffon and lace dress and matching jacket is a perfect wedding outfit while the classic red party dress exudes elegance for the cocktail hour. 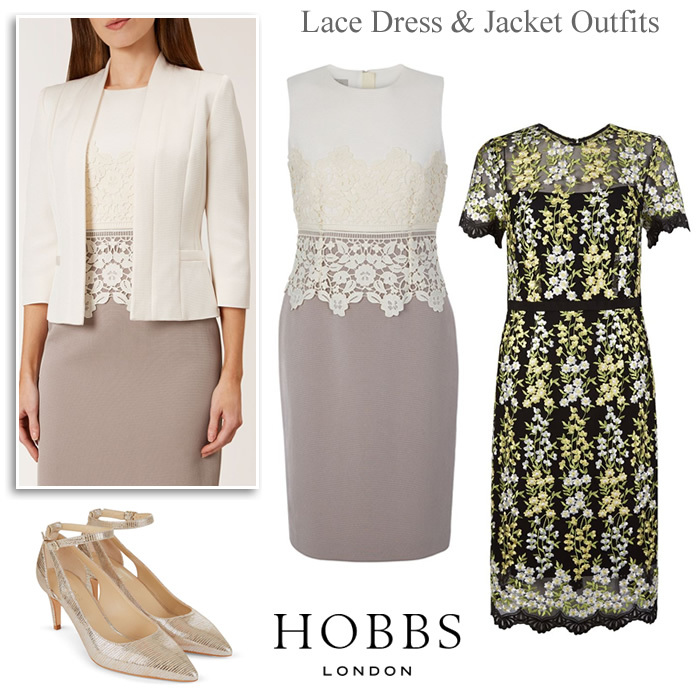 Hobbs occasionwear Mother of the Bride Mother of the Groom and wedding guest outfits in black and ivory. New for 2019 Arabella black and ivory confetti shift dress matching occasion coat and jacket. Fashion brands include Hobbs, Gina Bacconi, L. K. Bennett, Phase Eight, Fenn Wright Manson and Karen Millen. 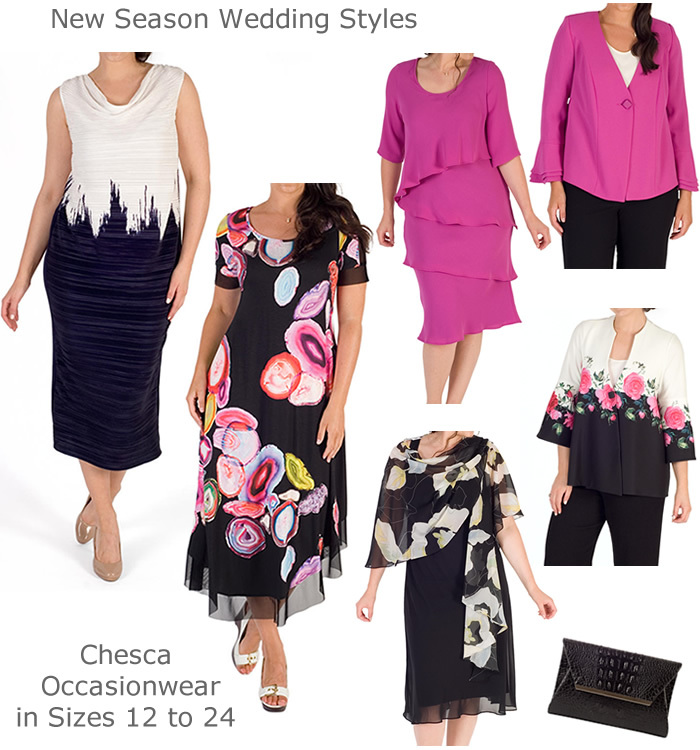 Whilst plus size clothing can be found at Chesca and Navabi. 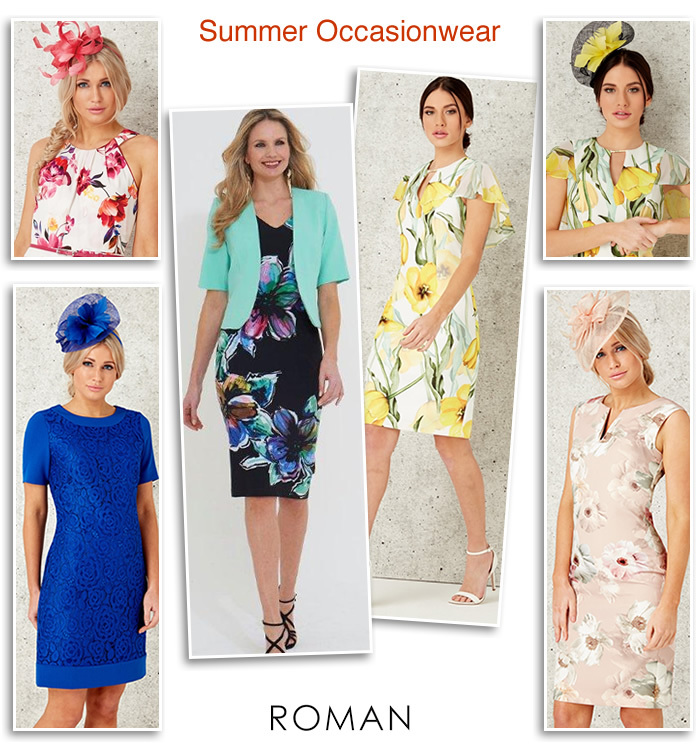 There is also affordable occasionwear at Roman with many wedding outfits under £50 and complete styles less than £100. For designer styles browse occasionwear brands at John Lewis & Partners. Why not invest in coordinating pieces to mix and match till your hearts content. Smart separates are easy to dress up to suit your style to see you through the seasons. Alternative wedding attire is also on hand to add a contemporary look. Try something new such as straight leg trousers with lace top and waterfall jacket. Fashionable trouser styles makes a refreshing change from traditional matching dress jacket and coat combinations. Sharp tailoring offers an instantly sleek and sophisticated day and evening look. Laid back elegance is easy too with slim leg trousers and blazer, wide palazzo pants and chiffon two piece suits. Simply add extra flair with on-point heels, clutch and statement jewellery and you are ready to go.